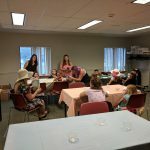 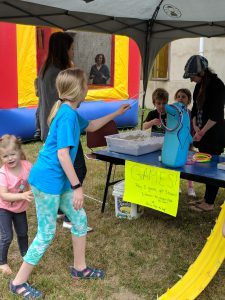 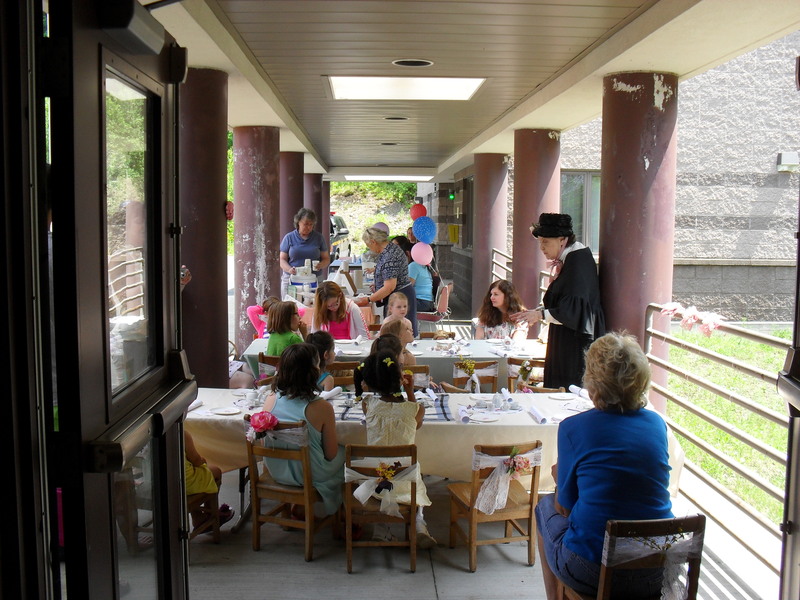 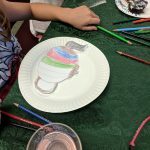 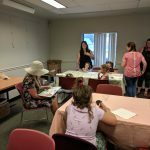 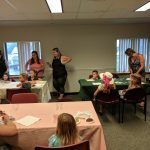 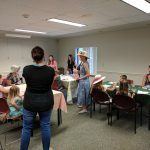 Photos from our Tea Party on August 1, 2018. 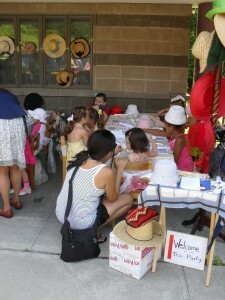 The children enjoyed lemonade and baked goods while listening to a silly story. 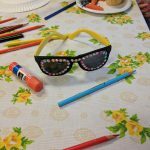 Then they bedazzled a pair of sunglasses and made their own tipping tea pots. 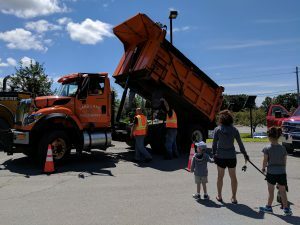 Pictures from Big Truck Day 2018. 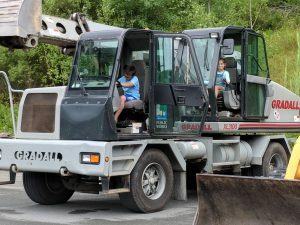 Thank you to the Sand Lake Dept of Public Works for bringing their cool trucks! 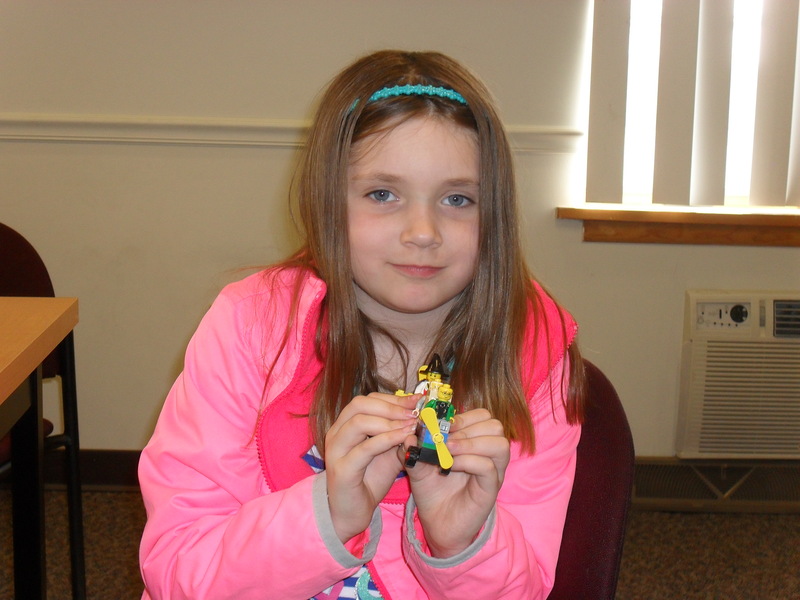 Just a couple of examples from today’s Builders’ Club (Wednesday, April 4, 2018. 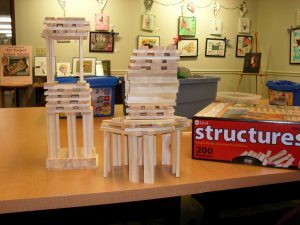 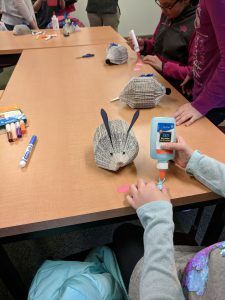 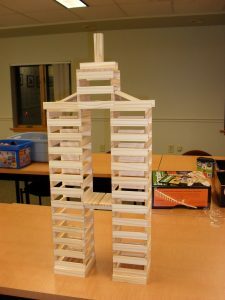 Photos from our most recent Builders Club. 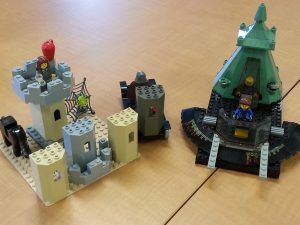 Check our calendar for our next Builders Club meeting! 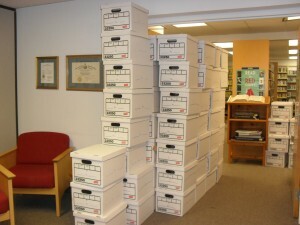 We’ve packed and shipped our first two boxes of books (157 books = 67 lb.) 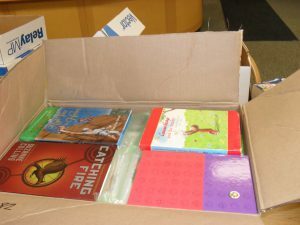 to hand out to the kids in the US Virgin Islands and Puerto Rico! 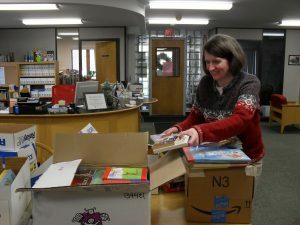 We will continue shipping until December 31st so if you have new kids’ books to donate, get them to us before then. 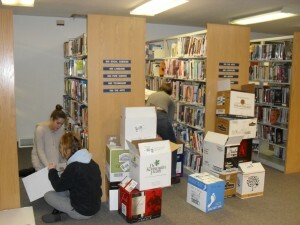 Thanks to everyone for their donations and contributions towards shipping. 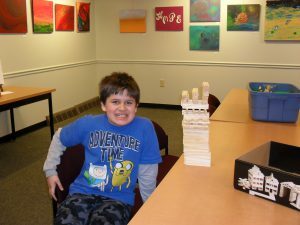 The Death Mobile by Isaac… and Adam’s Office Tower..
Monday (Oct 23) night’s Teen/Tween Halloween Painting Night was a hit! 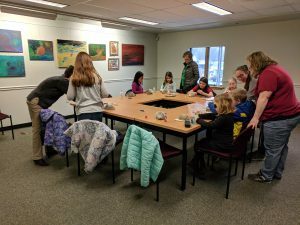 What a great group of artists! 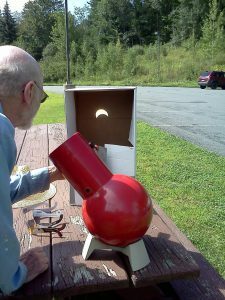 Check out this cool photo of the eclipse! 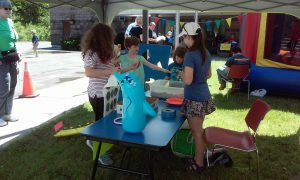 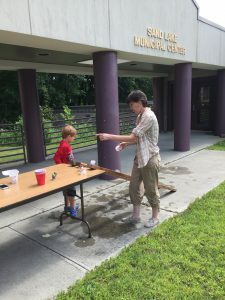 We were able to put together a last minute viewing on Monday with a few pairs of glasses, a telescope and a couple of pinhole cameras made by some of our enthusiast young patrons (Way to go Emily and Aidan!). 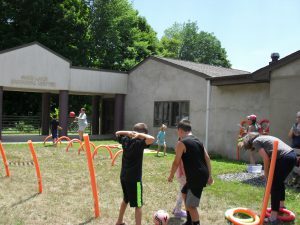 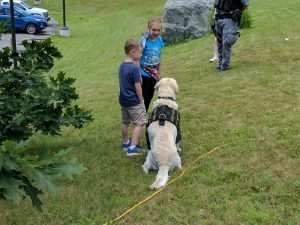 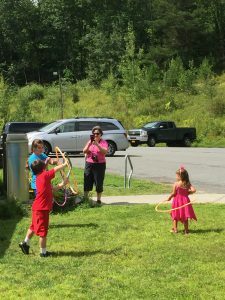 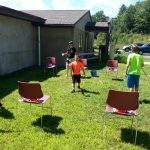 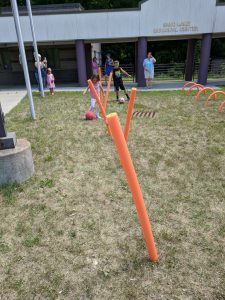 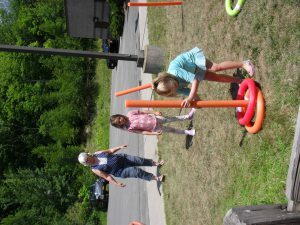 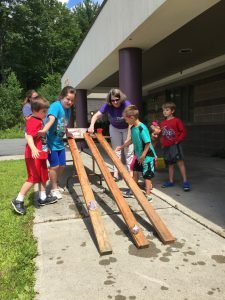 Check out the photos from Outdoor Fun program held on August 8, 2017. 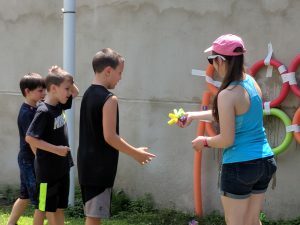 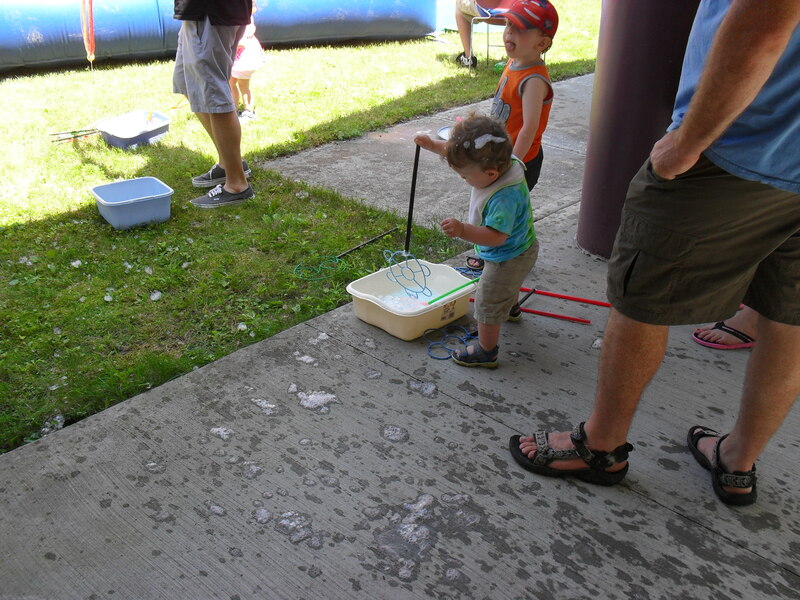 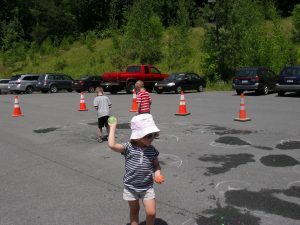 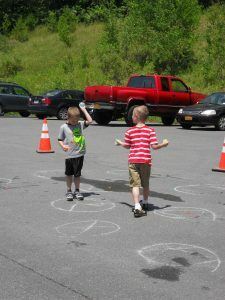 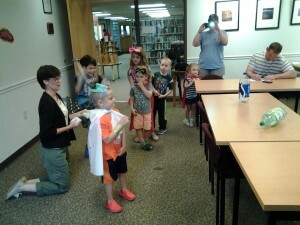 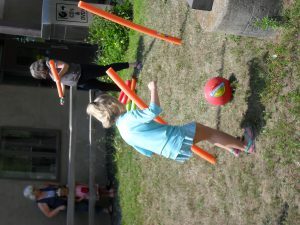 We had fun racing ice block heroes, tossing sponge bombs and hula hooping! 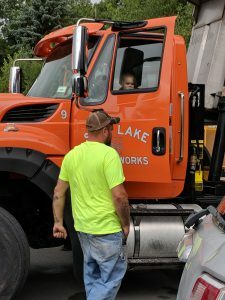 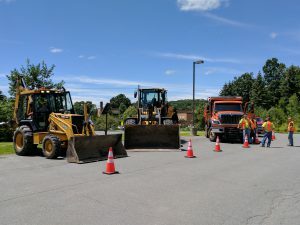 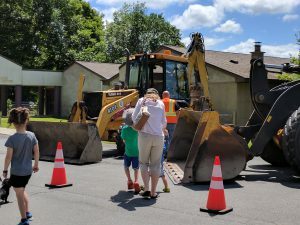 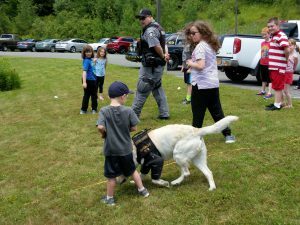 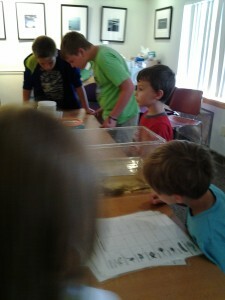 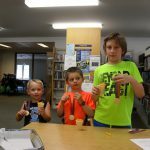 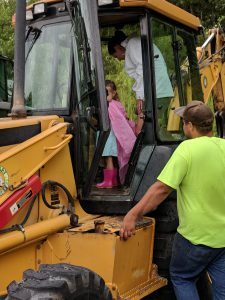 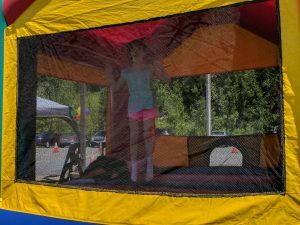 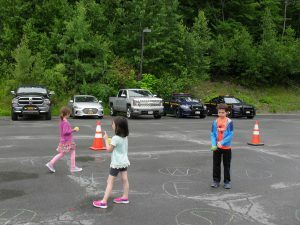 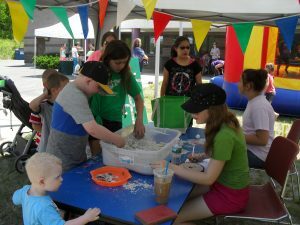 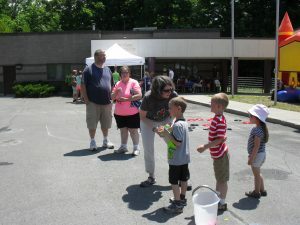 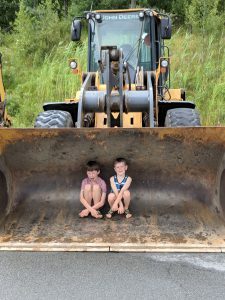 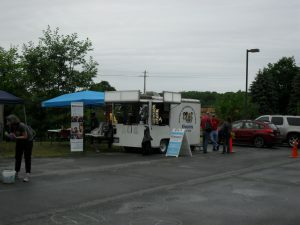 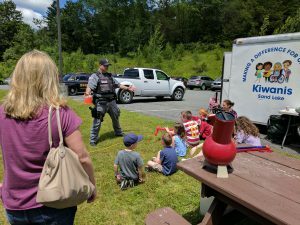 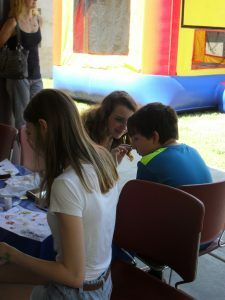 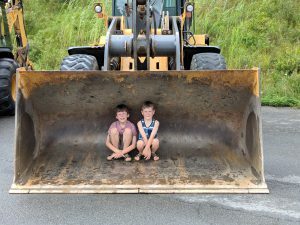 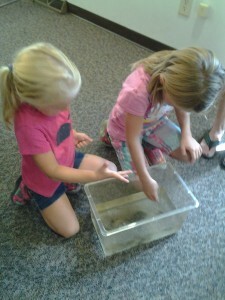 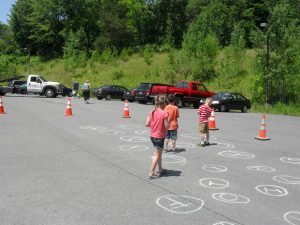 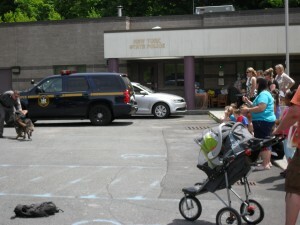 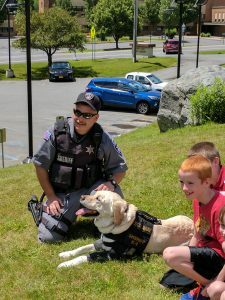 Photos from Big Truck Day at SLTL. 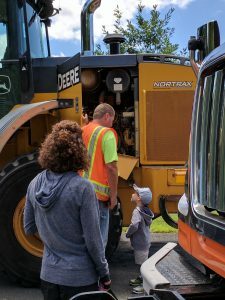 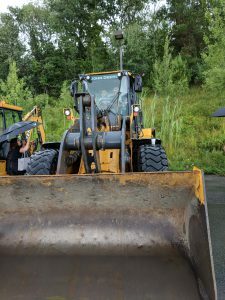 We hosted some of the big equipment from the Sand Lake Department of Public Works on Wednesday, July 26, 2017. 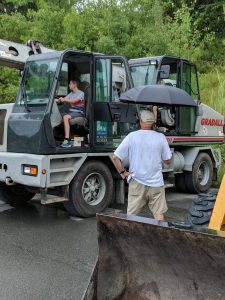 Thank you to the DPW for coming! 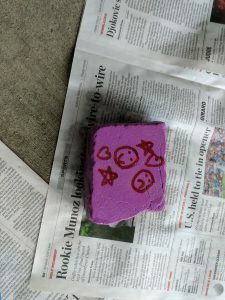 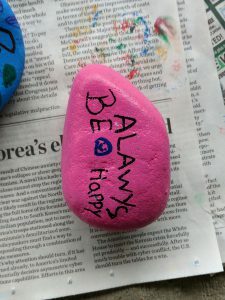 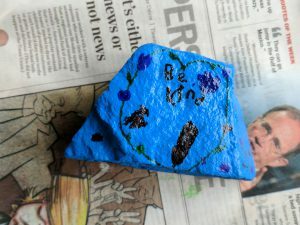 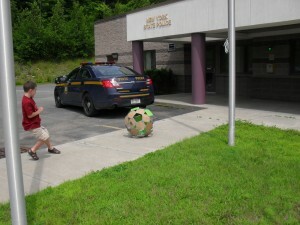 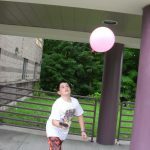 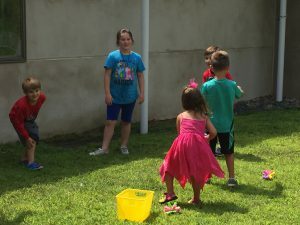 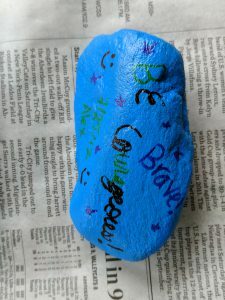 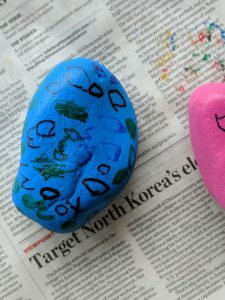 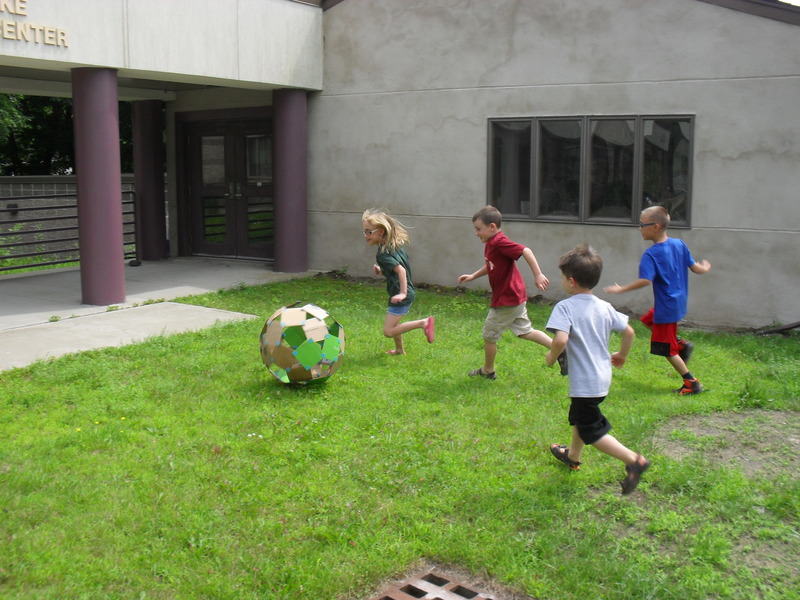 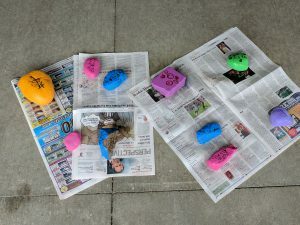 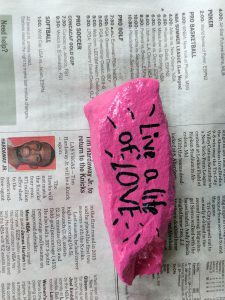 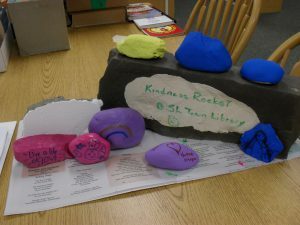 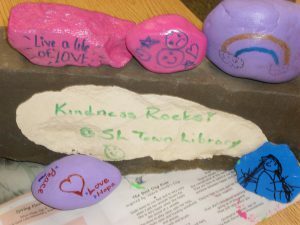 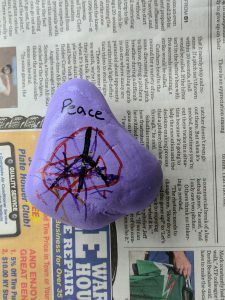 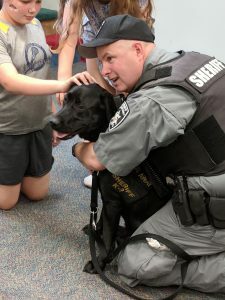 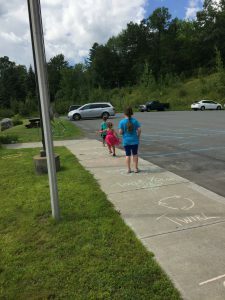 Check out the photos from our Kindness Rocks program held on Tuesday, July 25th. 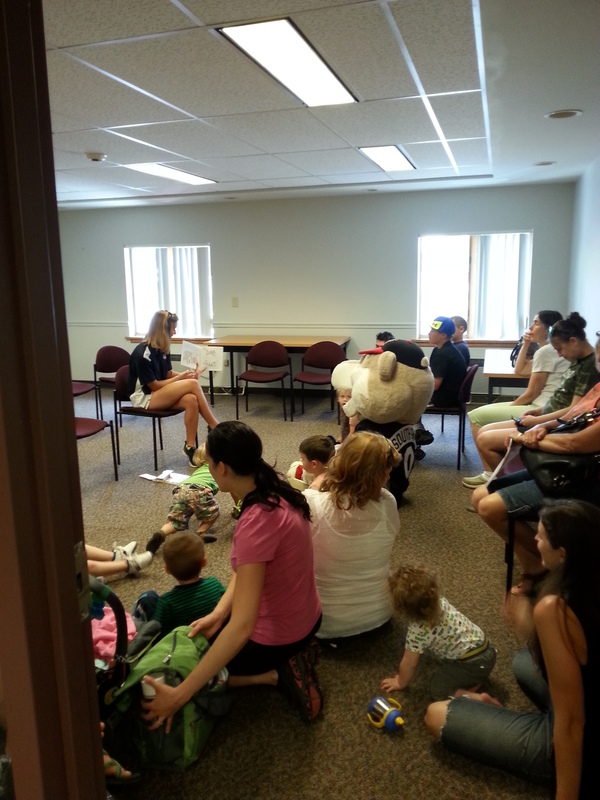 Thanks to all who came out! 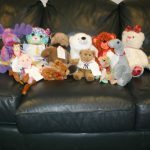 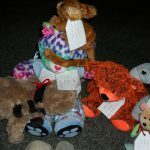 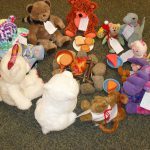 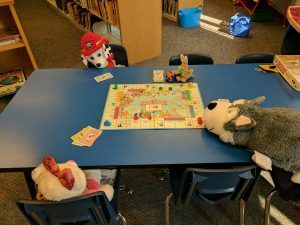 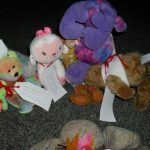 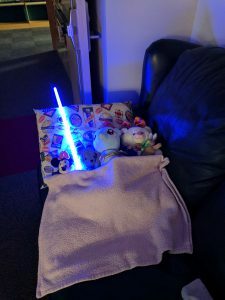 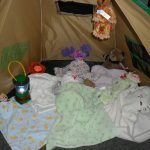 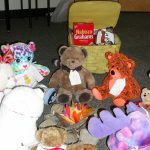 Photos from the 2017 Teddy Bear Sleepover–they were a wild and crazy bunch! 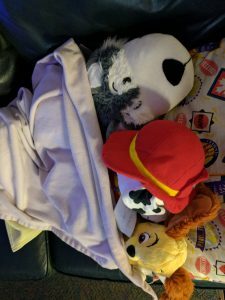 We are all going to need naps. 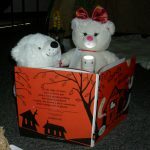 Do you see Savannah and Wolfie? 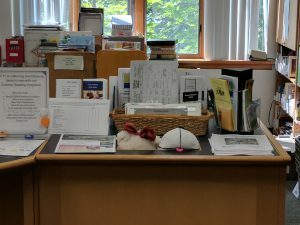 Hamster was our winner with this spot! 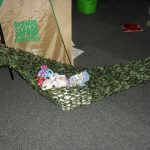 Rainbow Dash is here somewhere! The gang decided to play baseball…not sure that is a great idea! 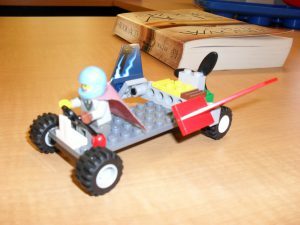 Uh-oh book cart races?? 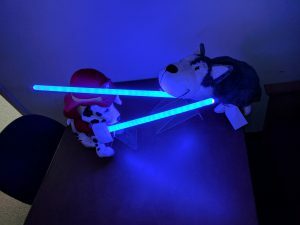 This is getting out of hand! 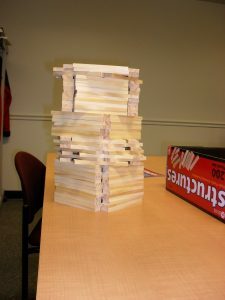 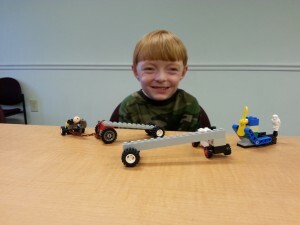 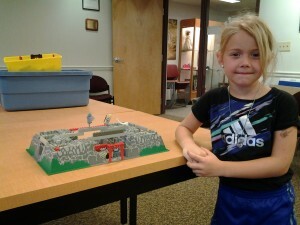 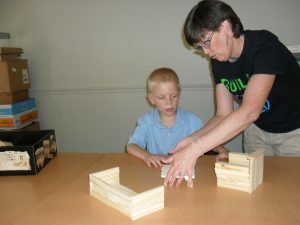 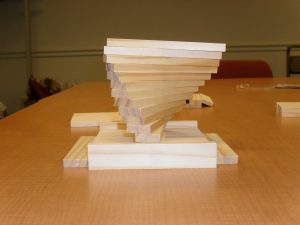 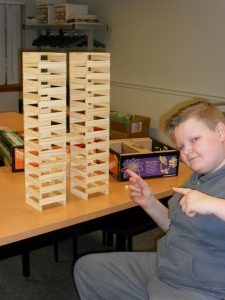 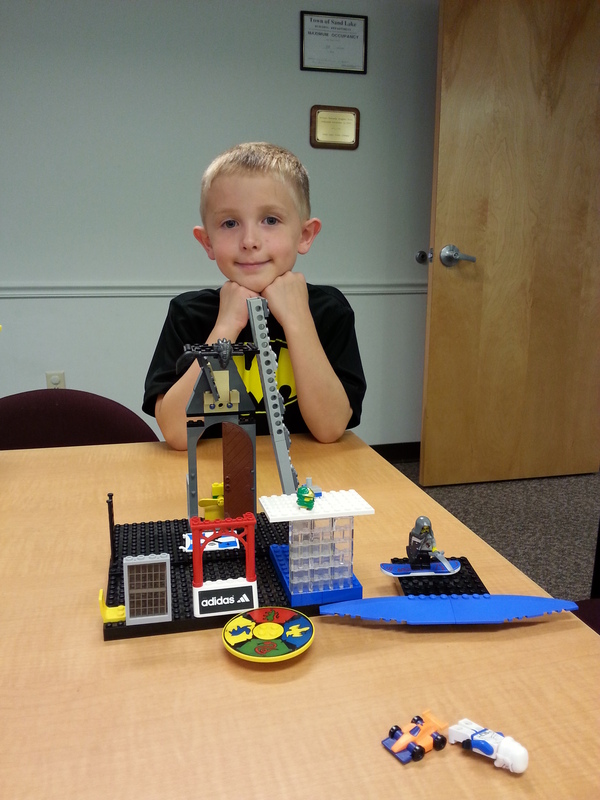 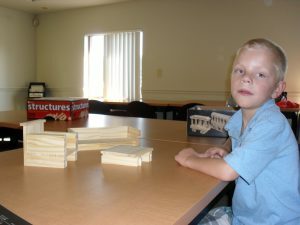 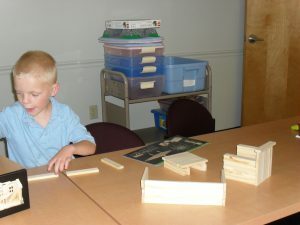 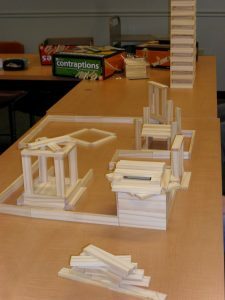 Builders’ Club – Konnor created many things with the new Keva Planks set. 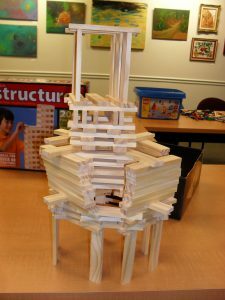 This furniture set was very impressive. 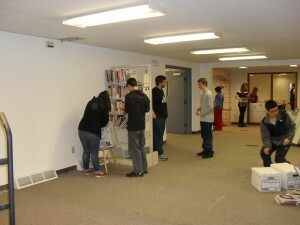 The film class at SLCA was in today to work on their film project. 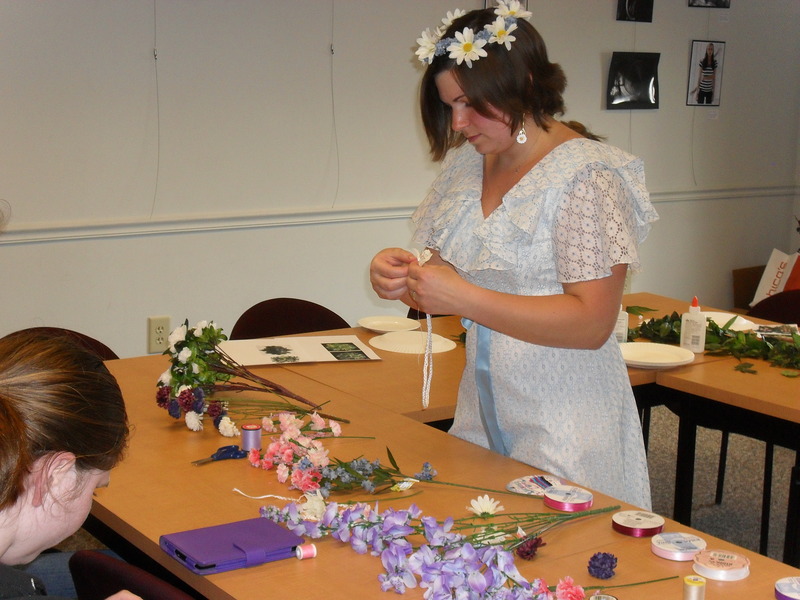 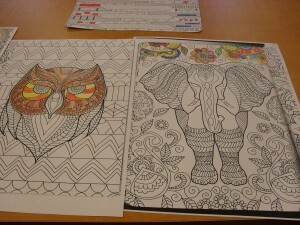 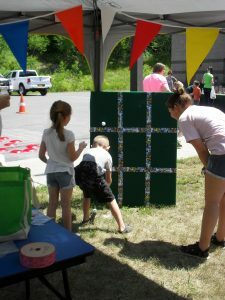 To see their finished product, stop by Sand Lake Center for the Arts on Friday, July 21st at 11:30am. 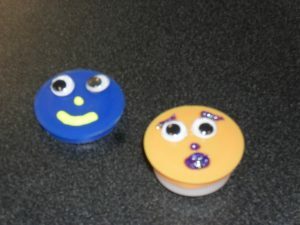 On July 17, Make-It Monday, we made emoticon magnets…. 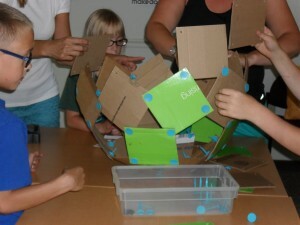 Join us Aug 7th to make a box top maze. 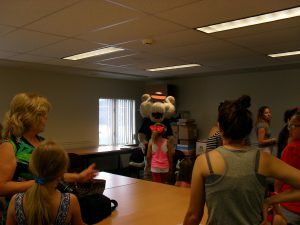 Thursday’s Valley Cats visit brought in a lot of people to see South Paw…. 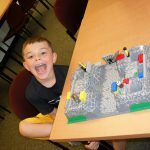 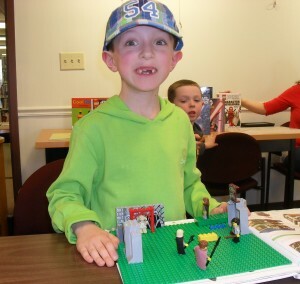 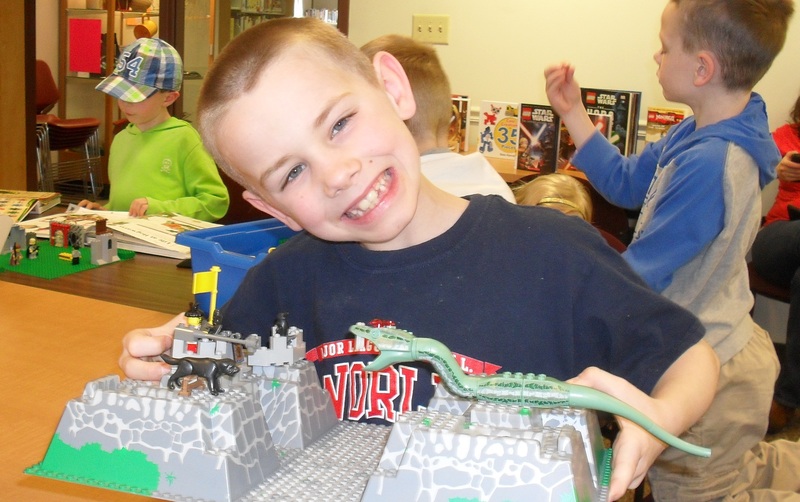 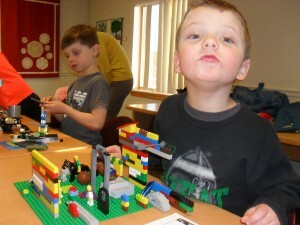 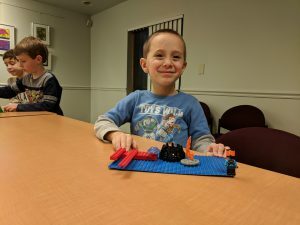 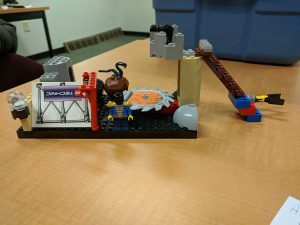 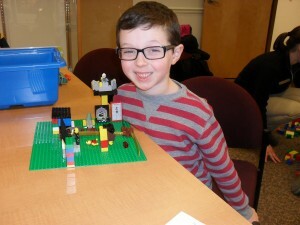 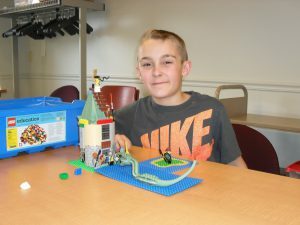 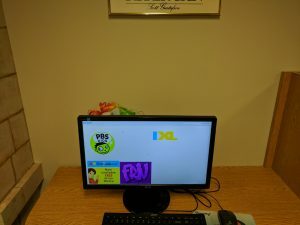 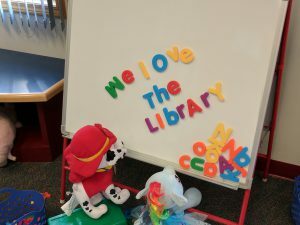 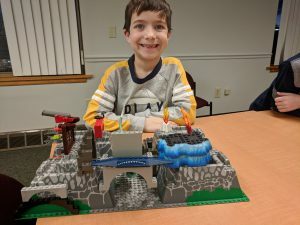 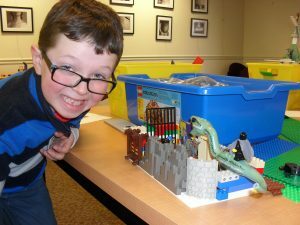 Photos from our most recent Lego Club! 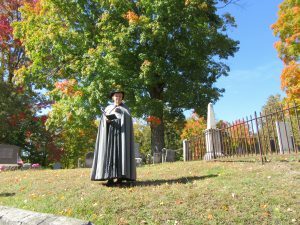 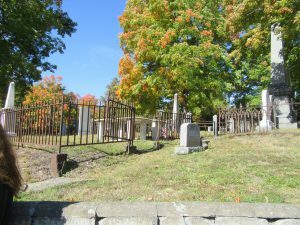 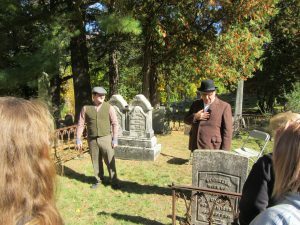 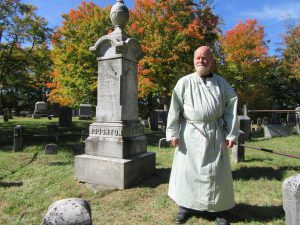 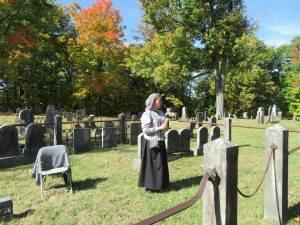 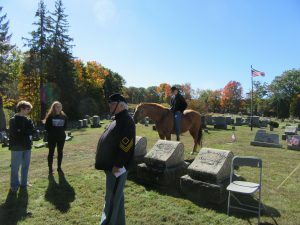 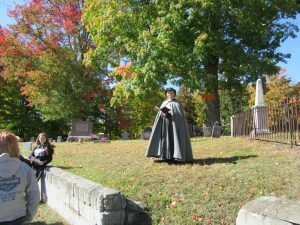 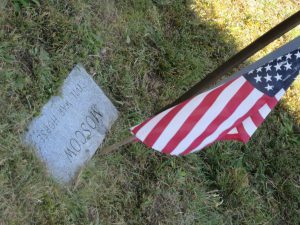 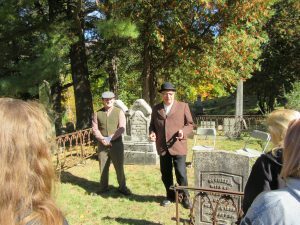 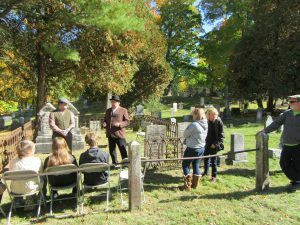 Photos from Amazing Graves held October 15-16, 2016. A special thanks to Donna Tallman for allowing us to use her pictures. 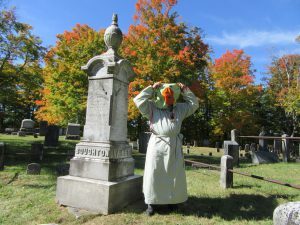 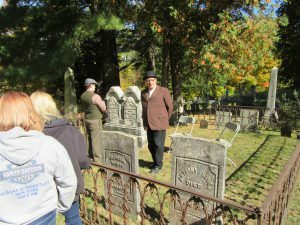 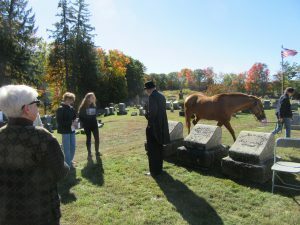 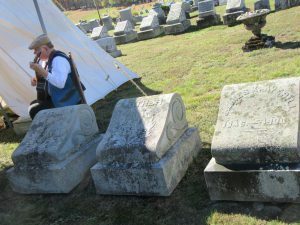 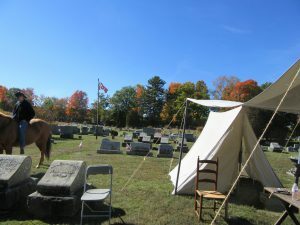 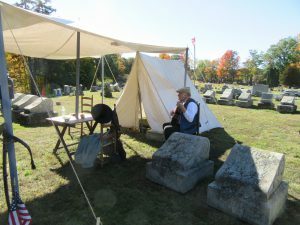 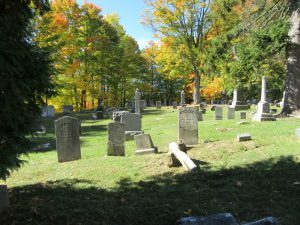 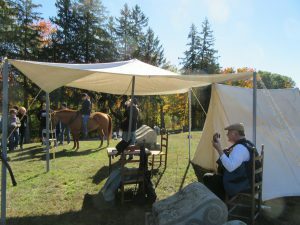 Thanks to all our volunteers who helped make Amazing Graves such a success! 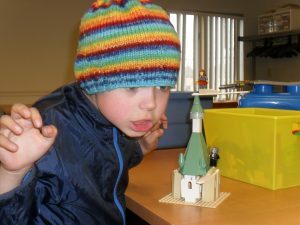 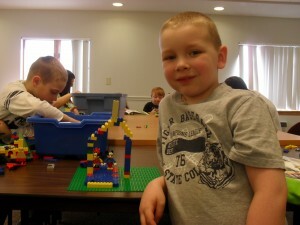 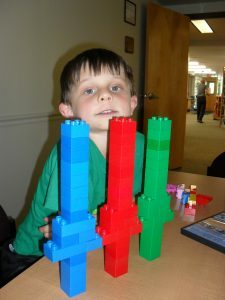 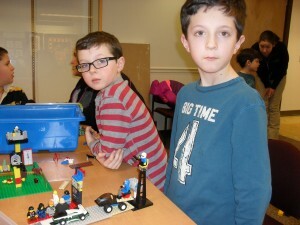 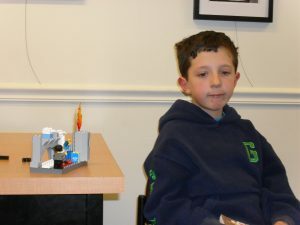 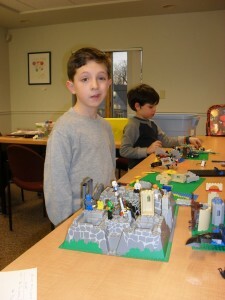 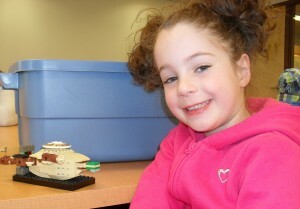 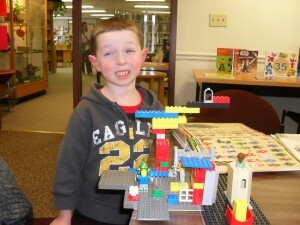 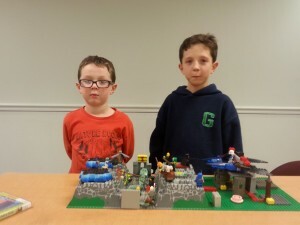 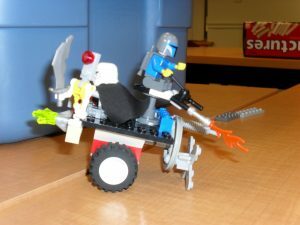 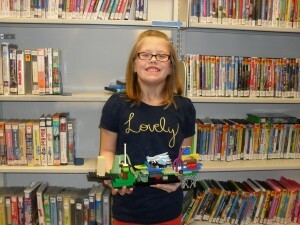 Photos from our most recent Lego Club. 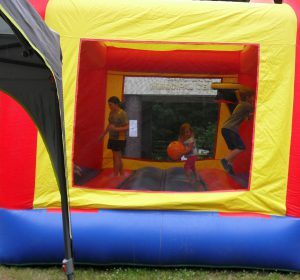 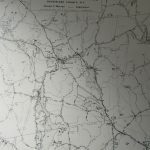 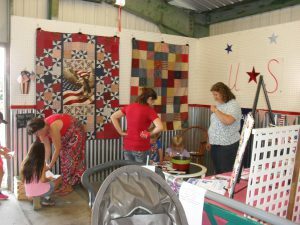 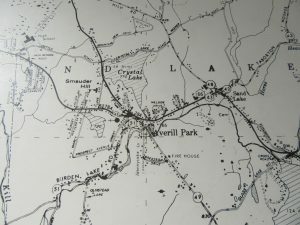 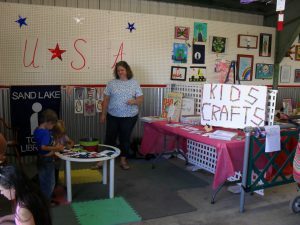 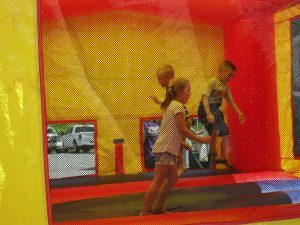 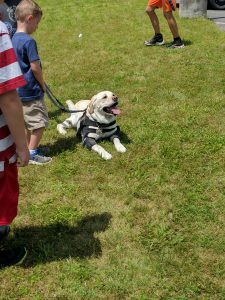 Photos from our time at the Schaghticoke Fair on Saturday, September 3, 2016! 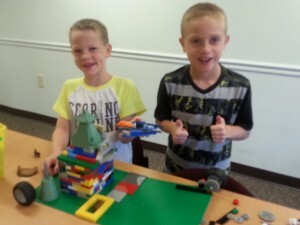 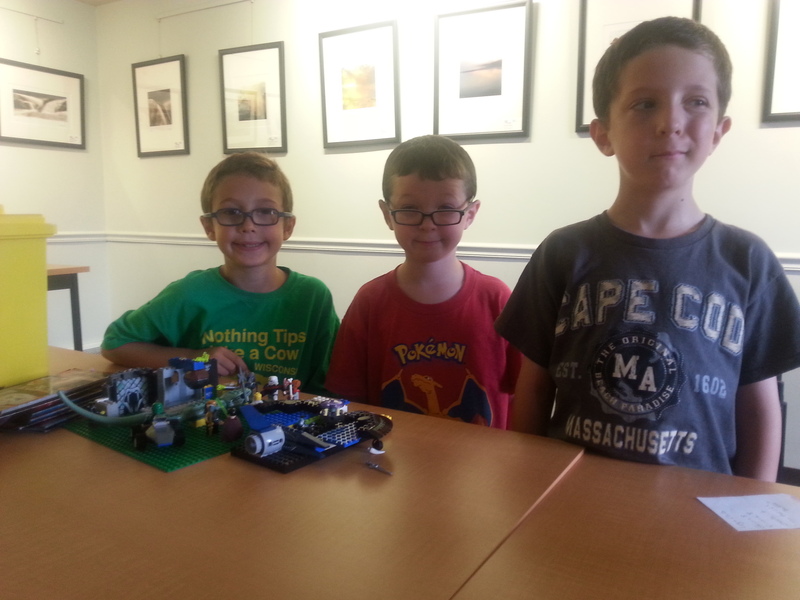 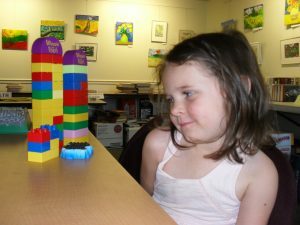 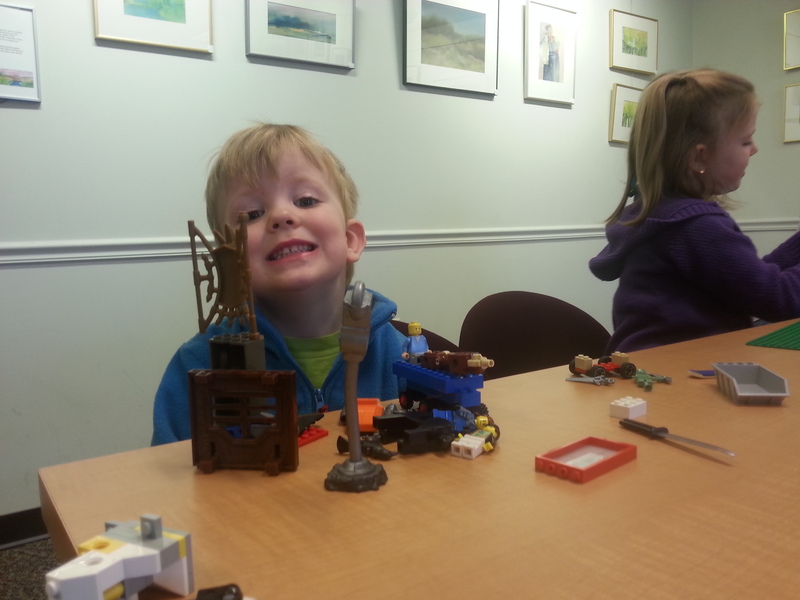 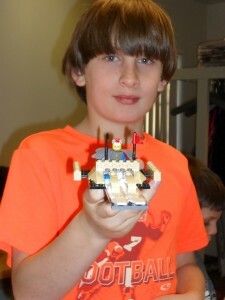 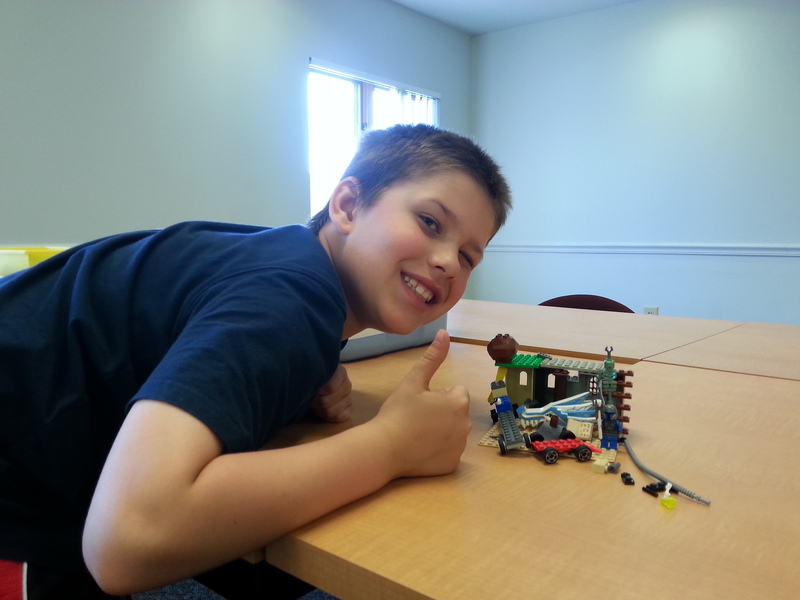 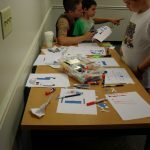 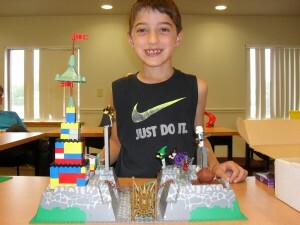 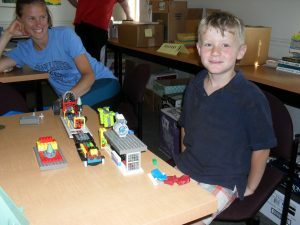 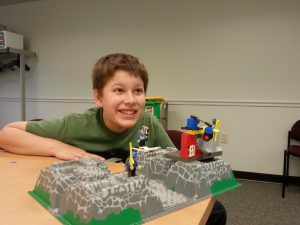 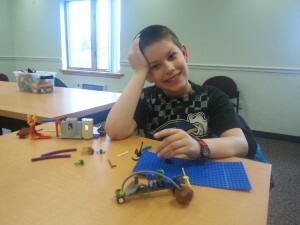 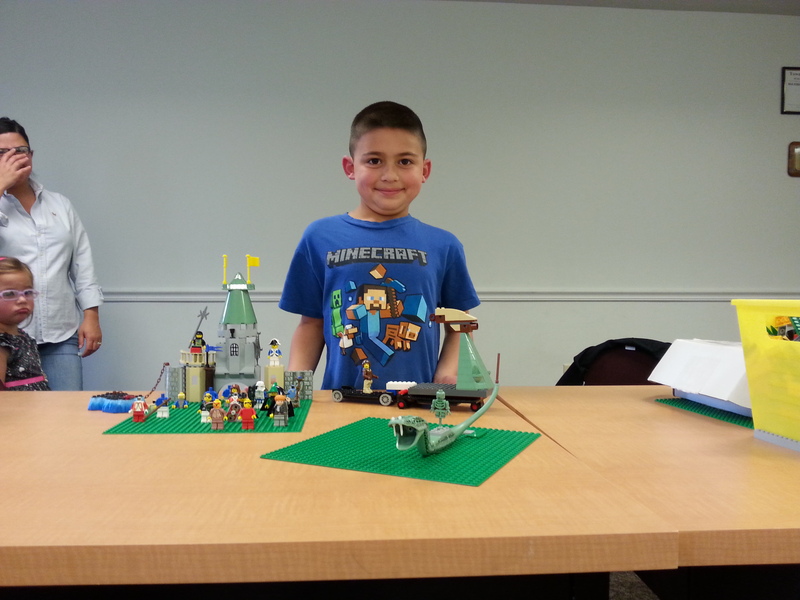 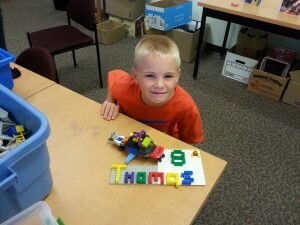 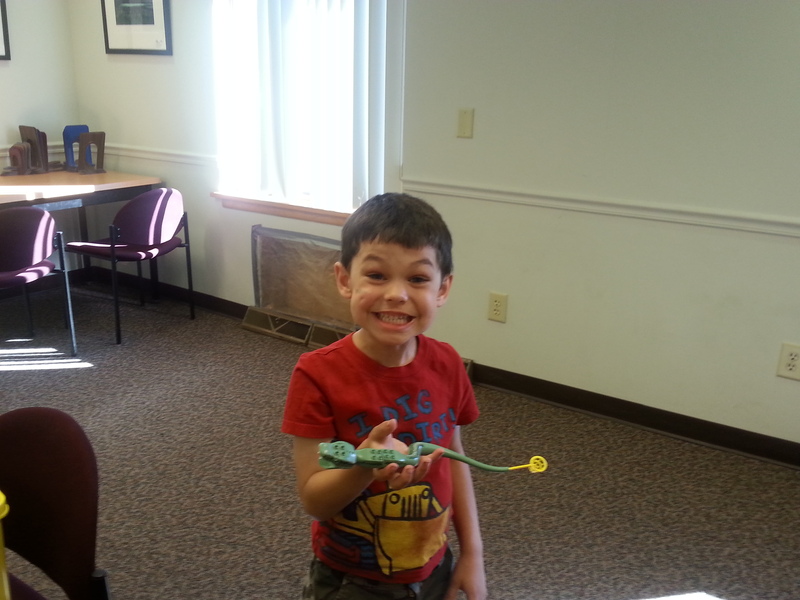 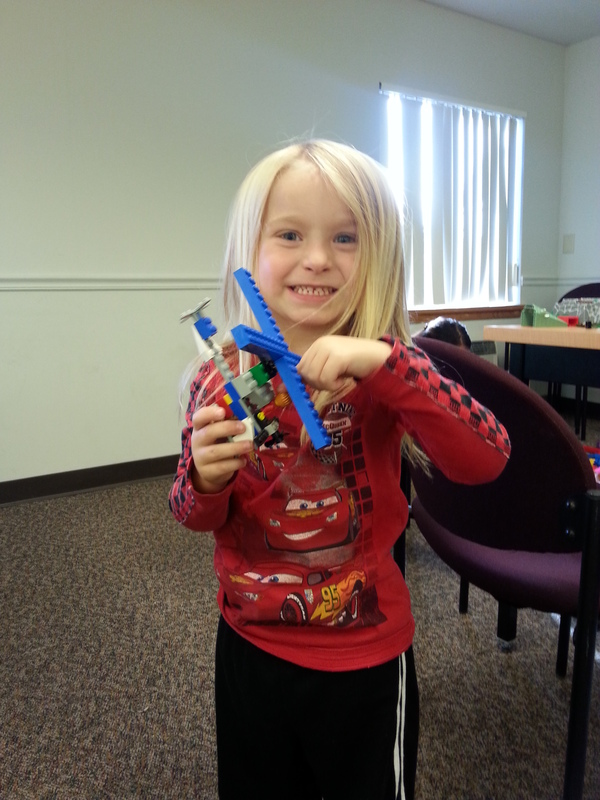 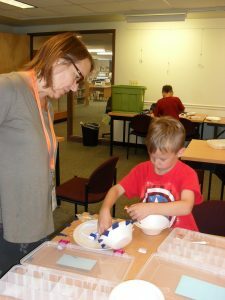 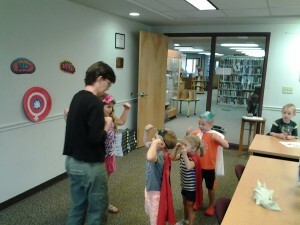 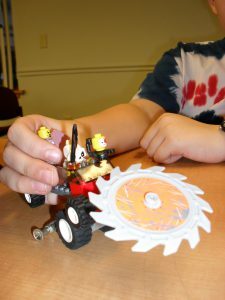 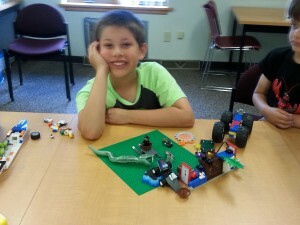 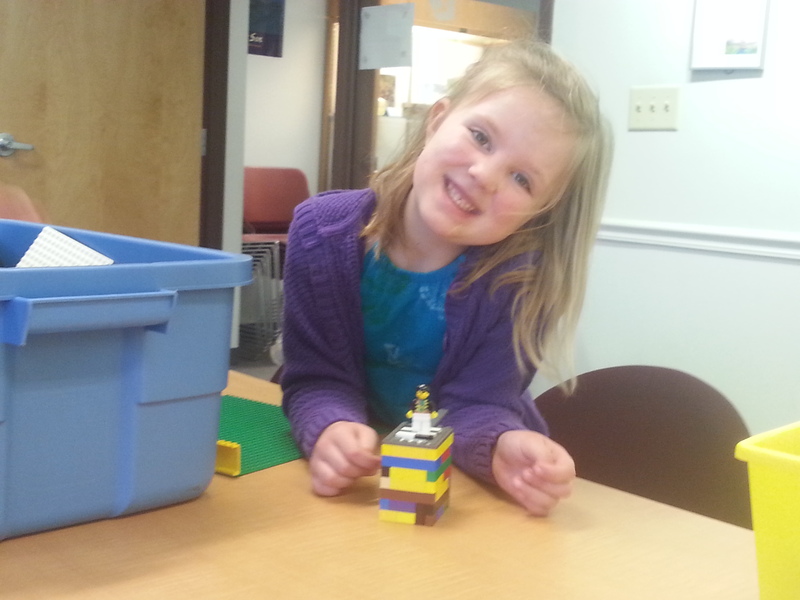 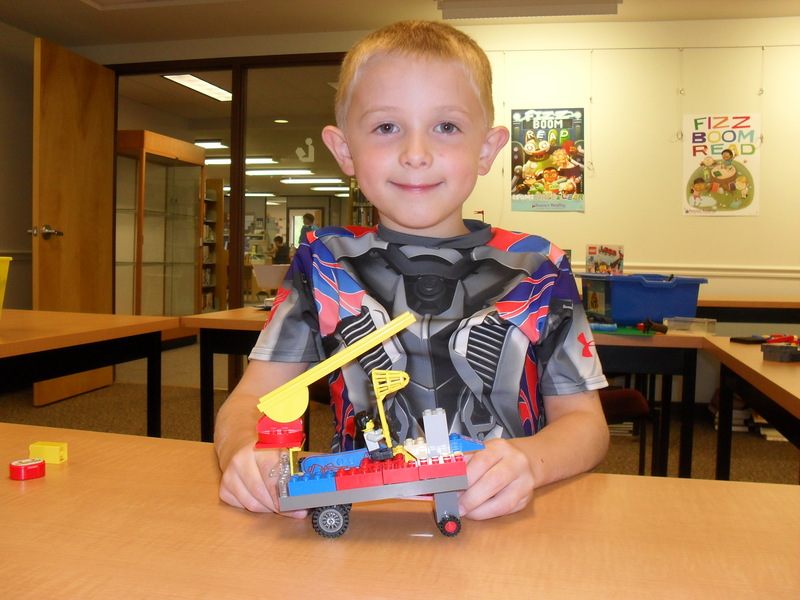 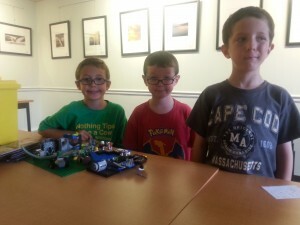 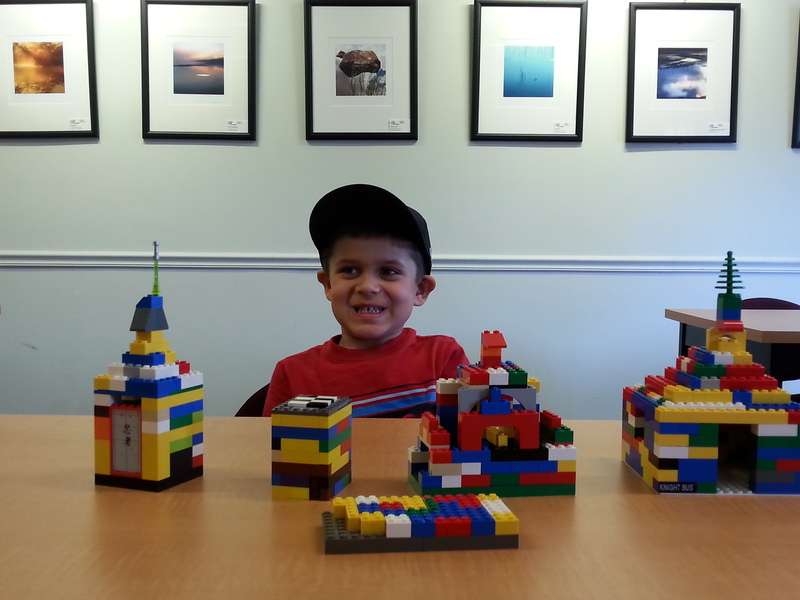 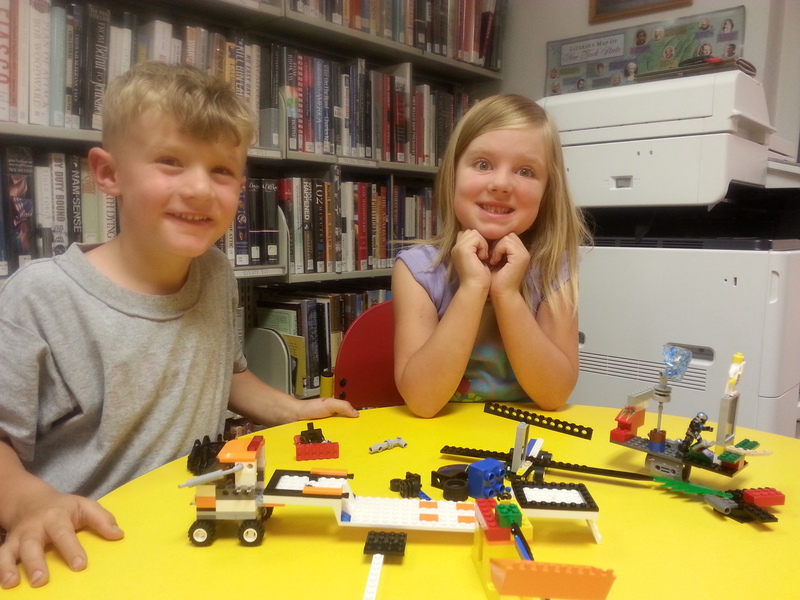 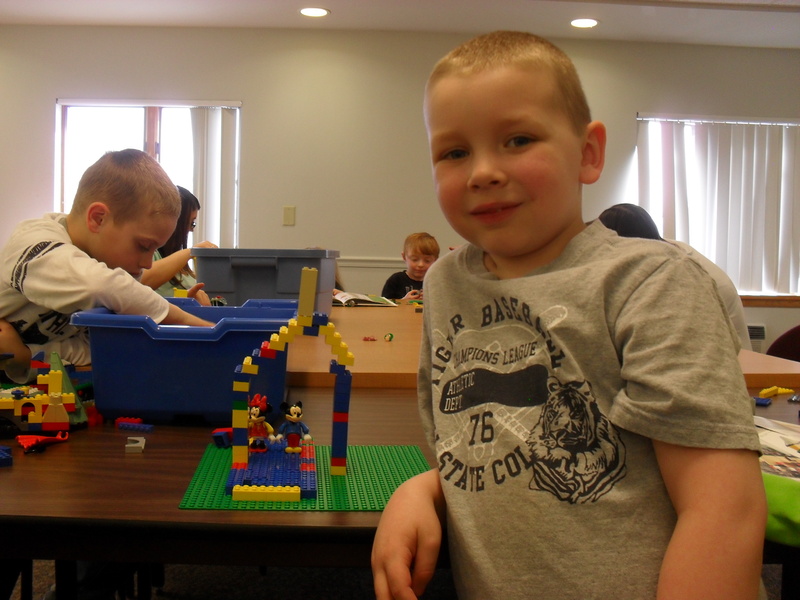 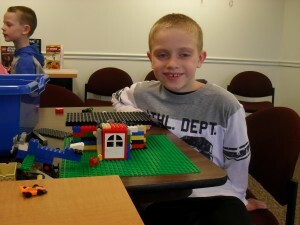 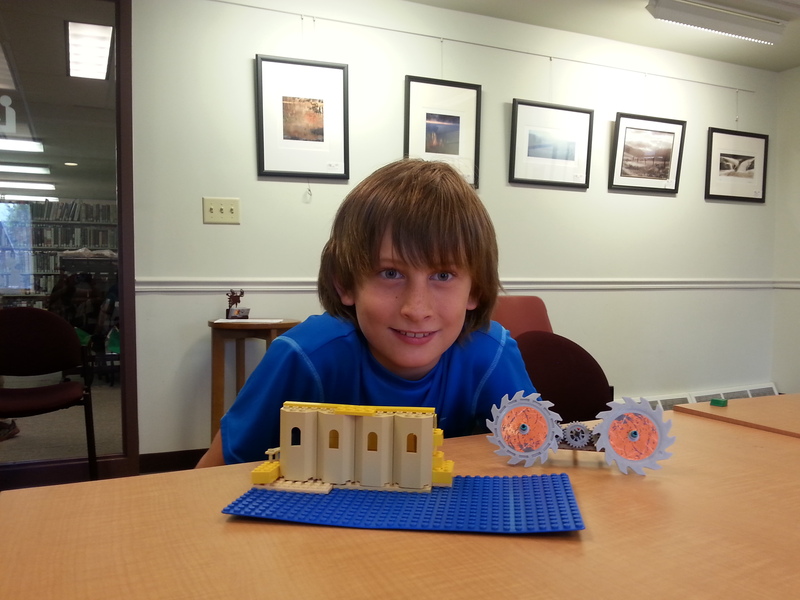 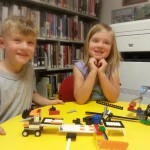 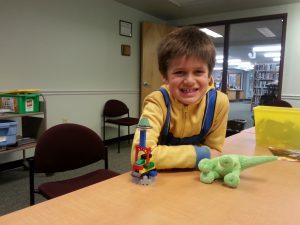 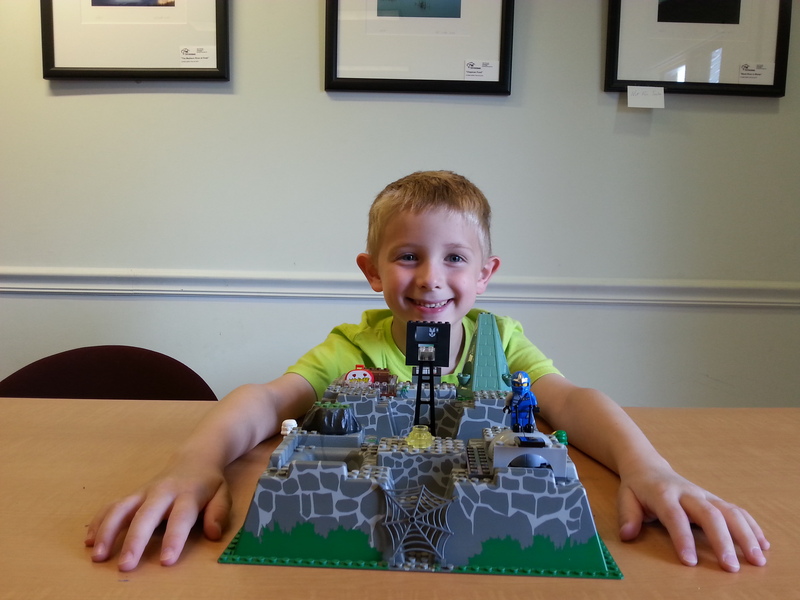 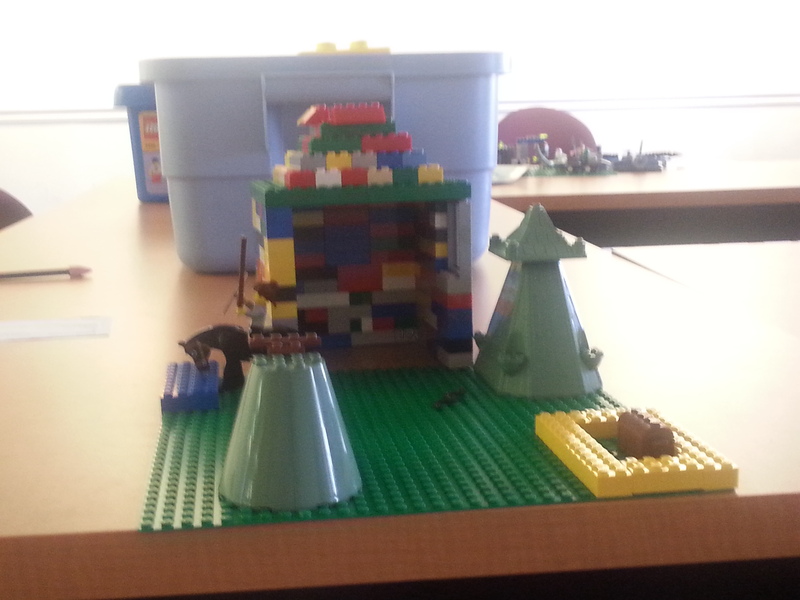 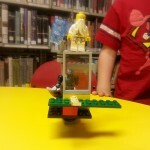 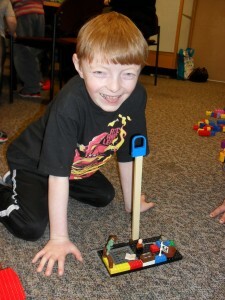 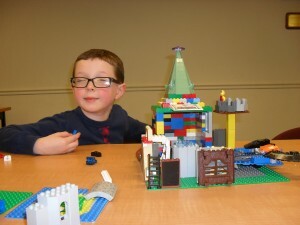 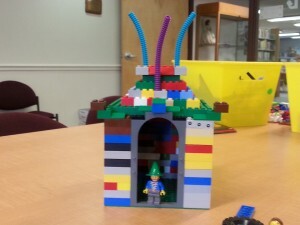 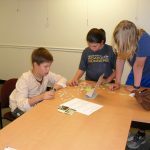 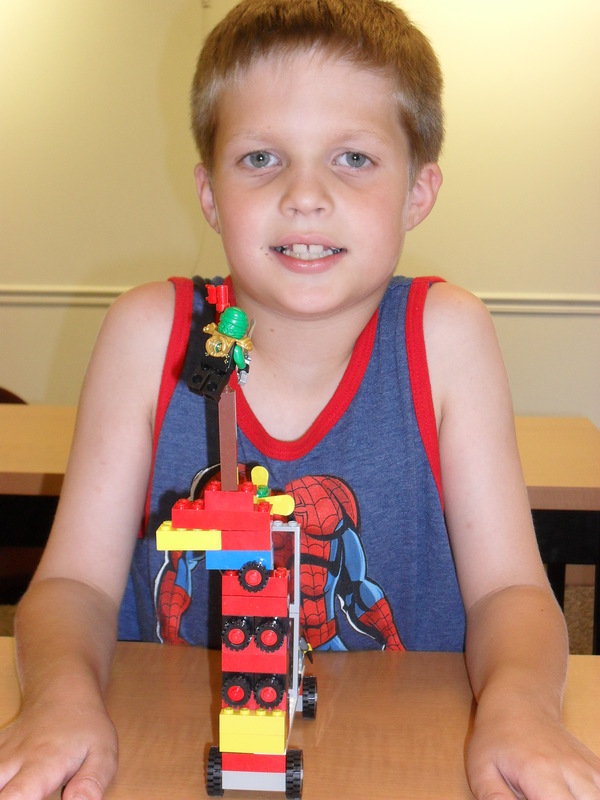 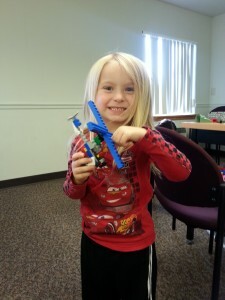 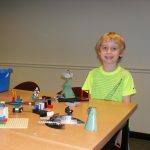 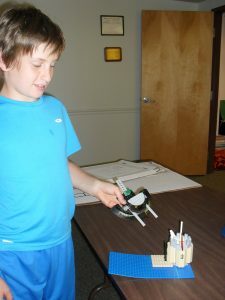 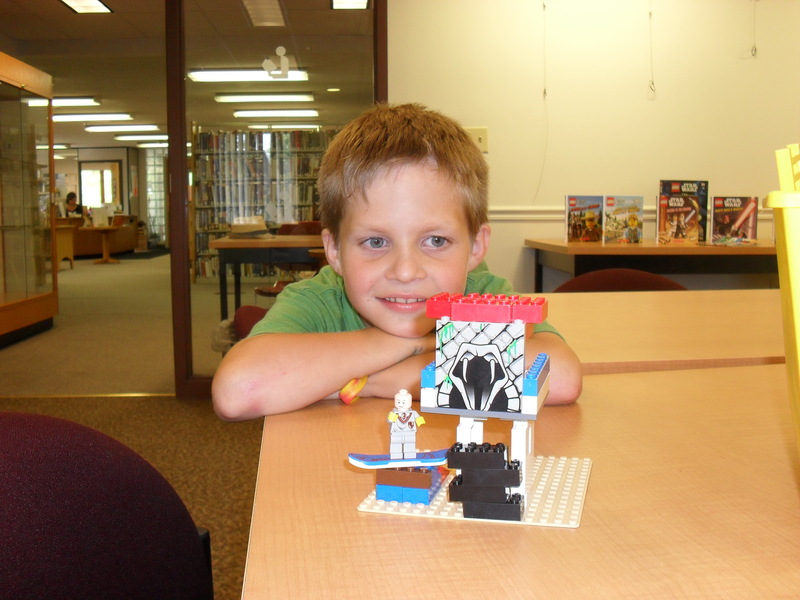 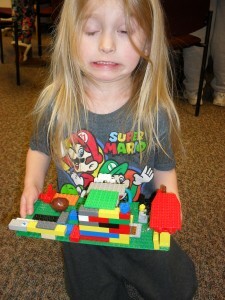 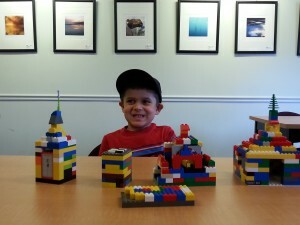 Photos from August 24th’s Lego Club… next session will be September 22nd. 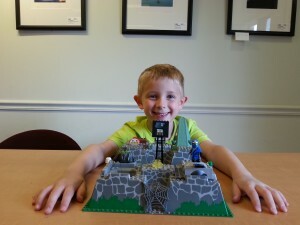 Battlefield by Aiden, age 6. 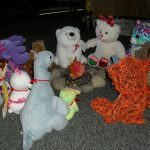 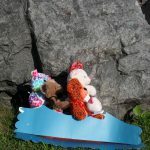 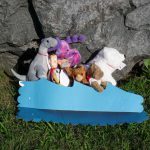 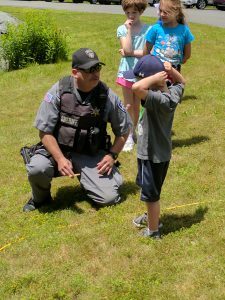 Photos from our 2016 Teddy Bear Camp-Out! 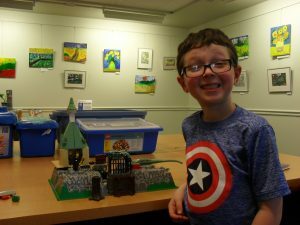 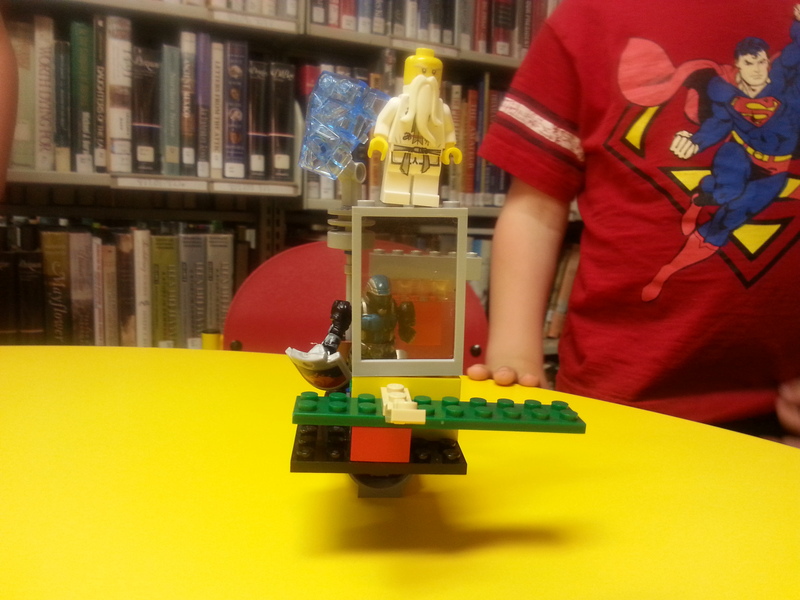 Photos from July’s LEGO Club…. 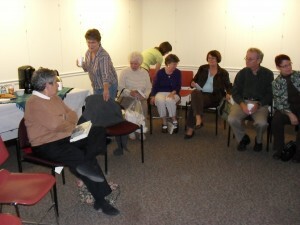 Our next meeting will be Thursday, August 25. 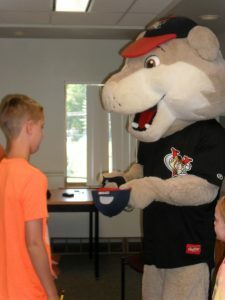 We had a great visit with SouthPaw from the TriCity ValleyCats on Thursday, July 21, 2016. 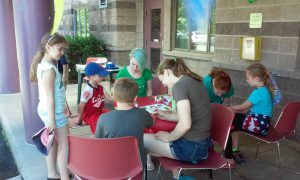 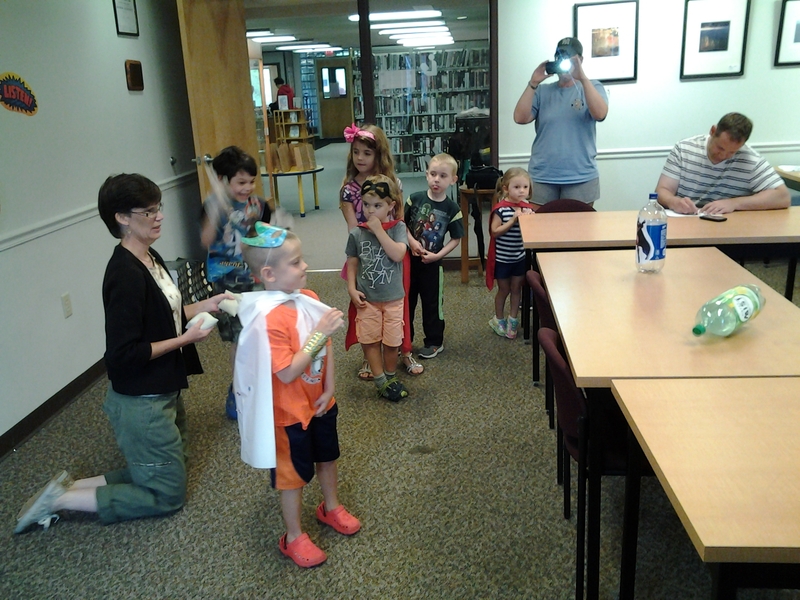 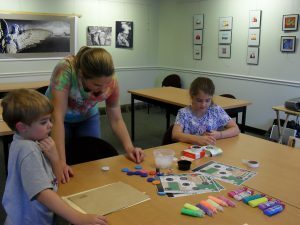 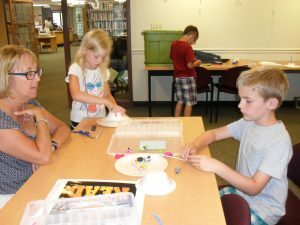 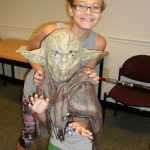 Check our the photos from “Gizmos, Gadgets & Games, Little Bits” program held on July 13, 2016. 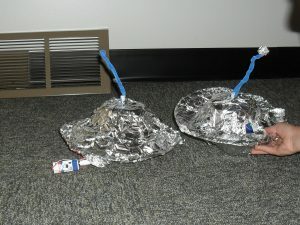 All the participants had fun building their UFO’s that included working lights and sound. 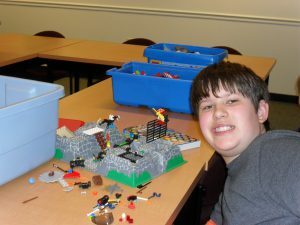 Photos from our most recent Lego Club. Our next Lego Club will take place on July 28th, 2016 at 4 PM. 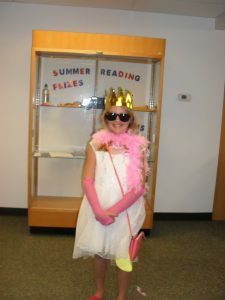 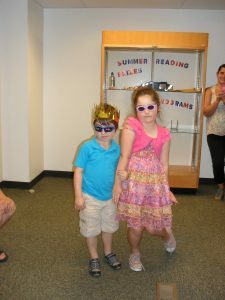 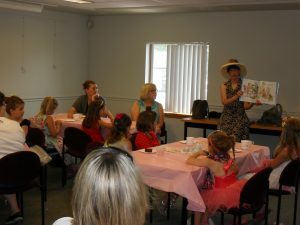 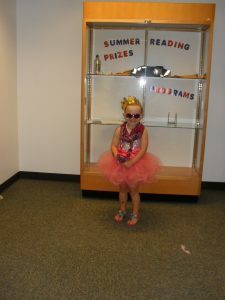 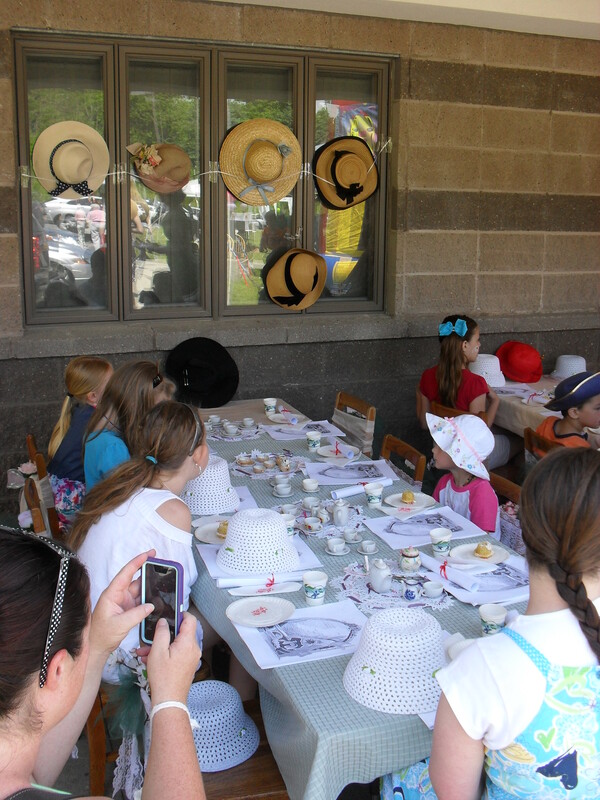 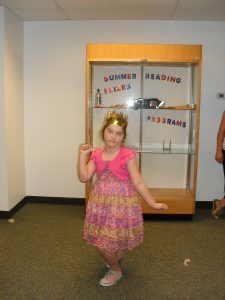 Check out the photos from our Fancy Nancy Tea party! 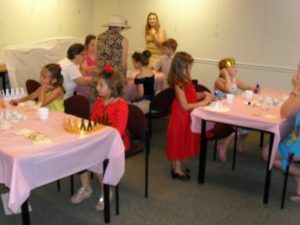 Everyone looked great and had a wonderful time! 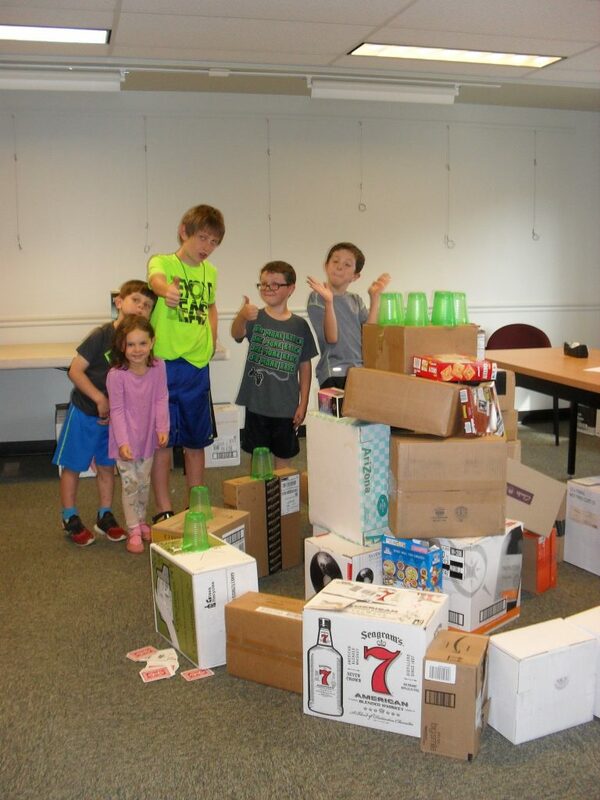 The gang at “Tinkering: Bridges and Skyscrapers.” After building their bridges and skyscrapers, they all worked together to build a castle (shown below). 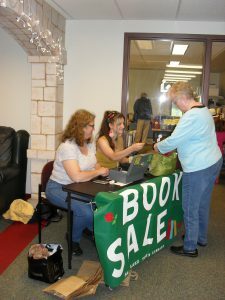 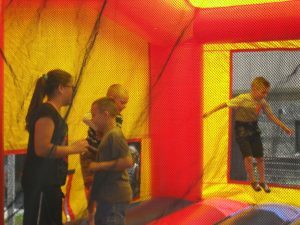 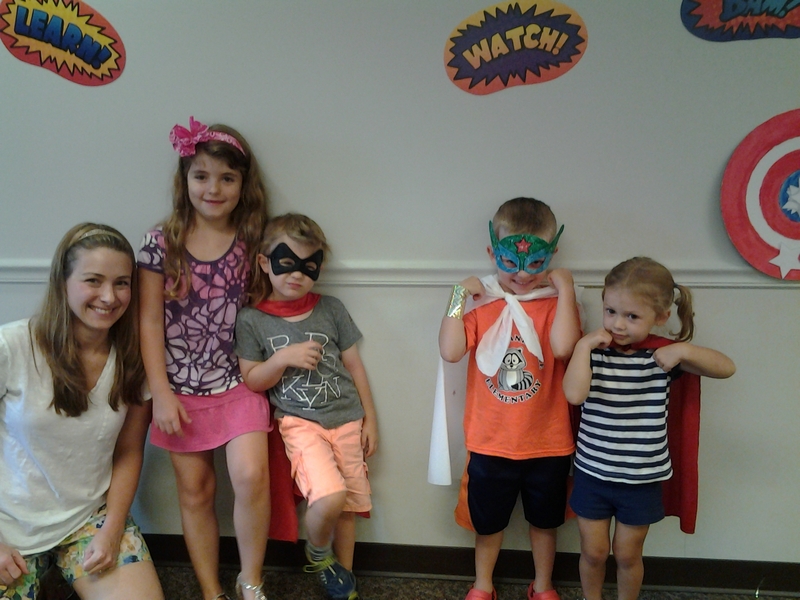 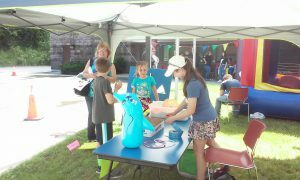 Check out the photos from the 2016 Annual Library Fair and Summer Reading Kick-off! 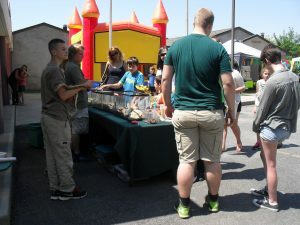 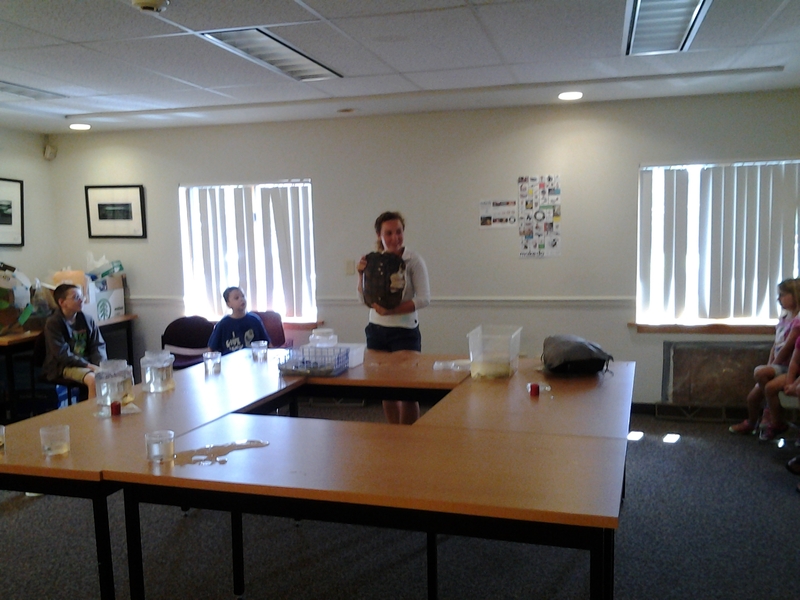 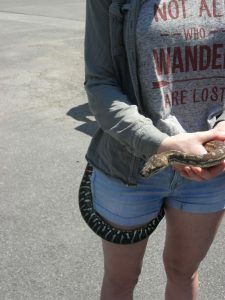 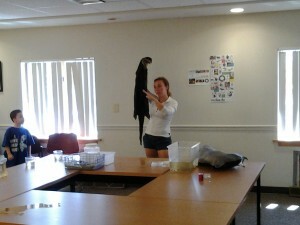 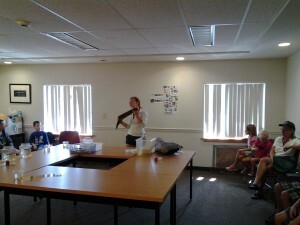 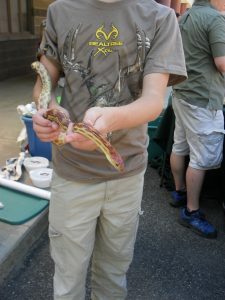 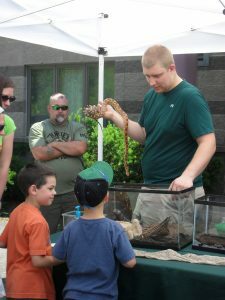 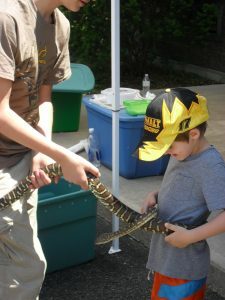 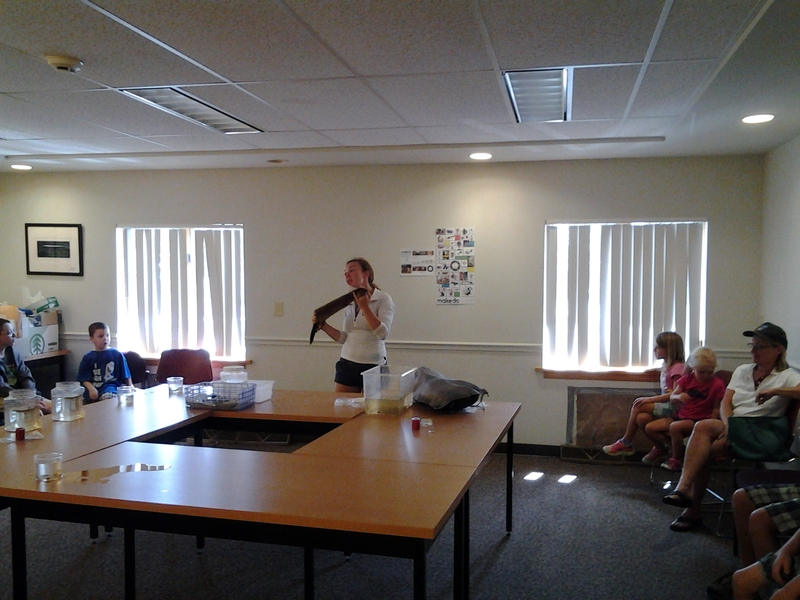 A special thanks to Uncharted Wild for bringing their reptiles. 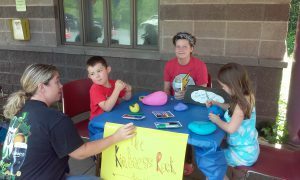 Thanks to all our volunteers who helped make it such a fun day! 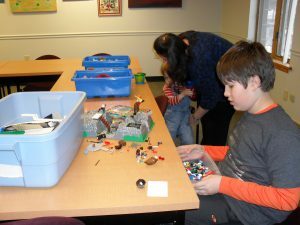 Photos from our most recent Lego Club. 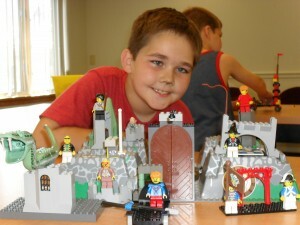 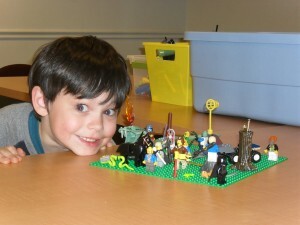 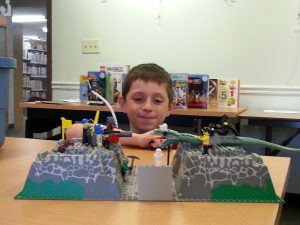 Join us Saturday, July 16th at 11:30 AM for a special edition of Lego Club that will include an I Spy the Lego Guy hunt! 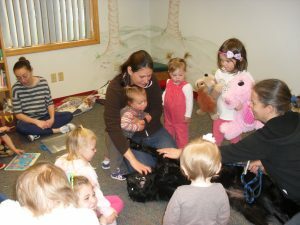 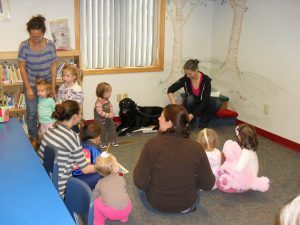 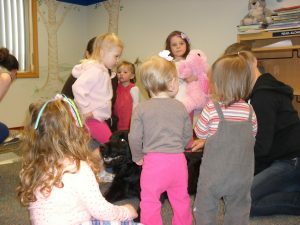 Photos from our May 5, 2016 Dog Themed Storytime with Miss MaryMargaret. 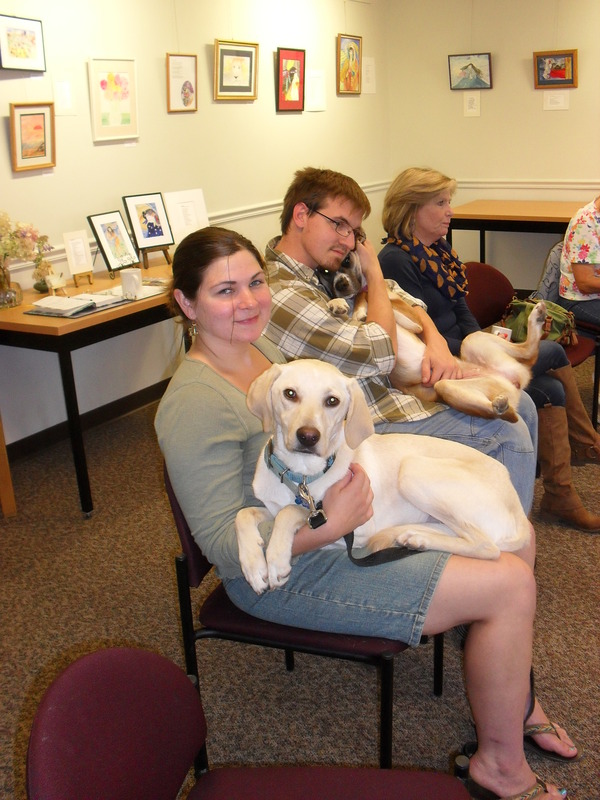 The special guest star was Cricket, Miss MaryMargaret’s dog. 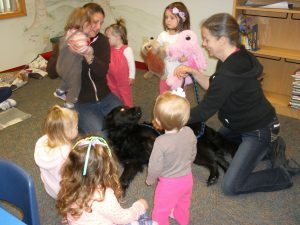 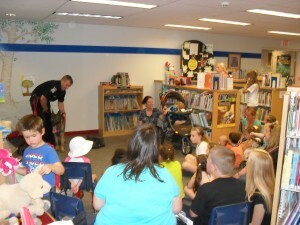 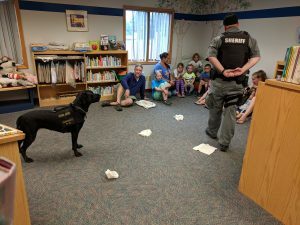 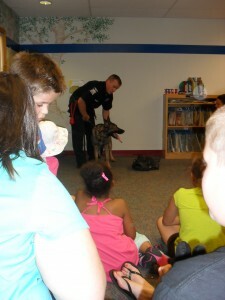 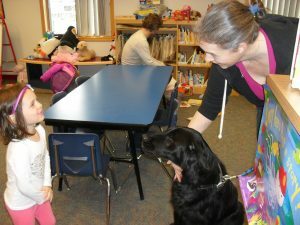 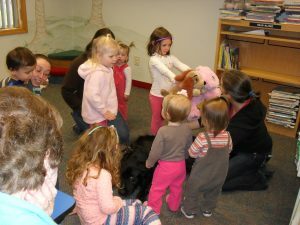 She came to help teach our storytime friends all about dogs, how to approach them and how not to be scared of them. 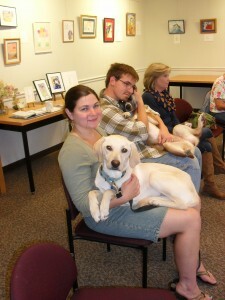 She was a wonderful guest and everyone loved her! 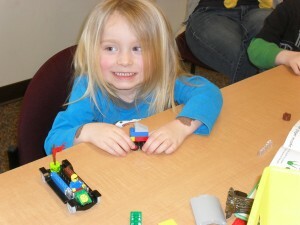 Photos from our most recent Lego Club! 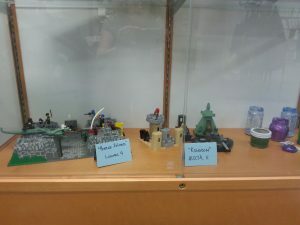 We’ve also started putting our Lego Creations on display for a couple weeks in our display case! 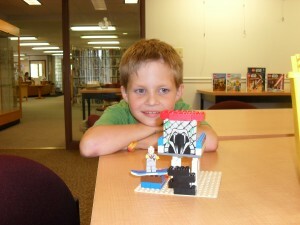 Our next Lego Club will be held Thursday, May 26th from 4:00 to 5:00 PM. 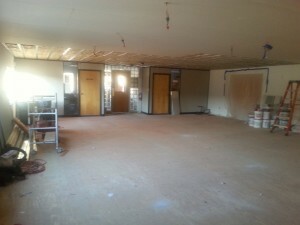 Renovation Update–the third week is complete! 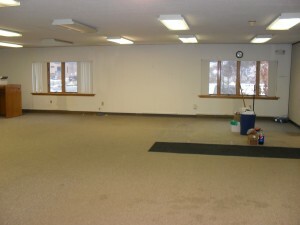 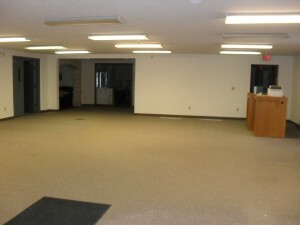 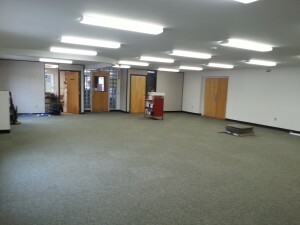 The room has been re-painted and the new lighting and new carpet have both been installed. 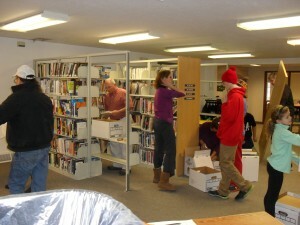 We need to clean up a bit and then we’ll start the process of moving the shelves, books and furniture back in. 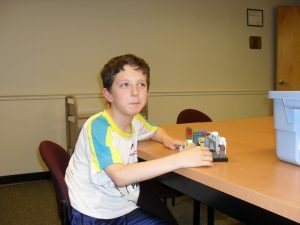 Photos from our most recent Lego Club. 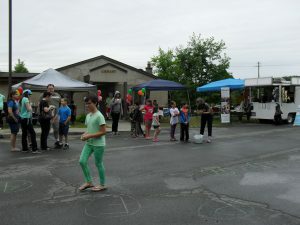 What a great crowd! Our next Lego Club will be Thursday, February 25th from 4-5 PM. 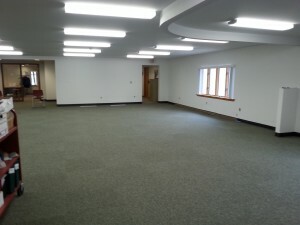 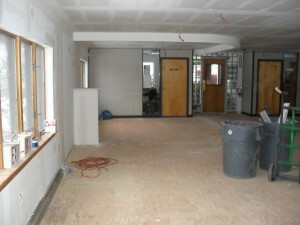 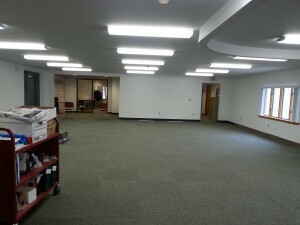 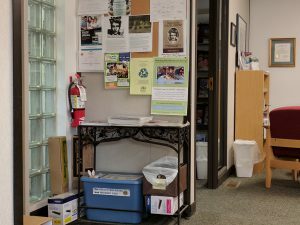 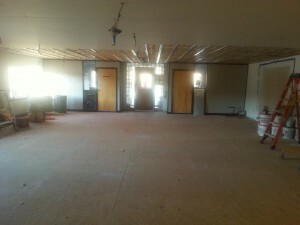 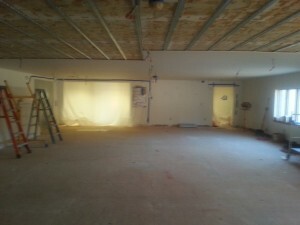 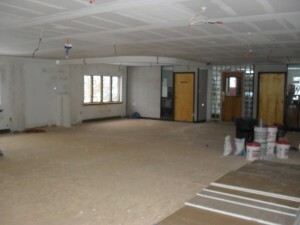 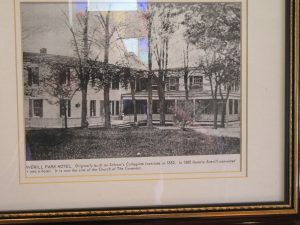 Renovation Update–the second week of renovation is complete! 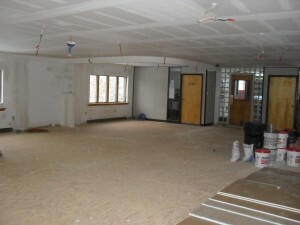 We have a beautiful new ceiling, a soffit above the soon-to-be-circulation desk and the walls are being patched and prepped for fresh paint. 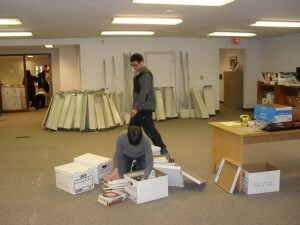 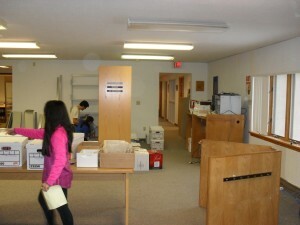 Photos of the packing process for the upcoming renovation. 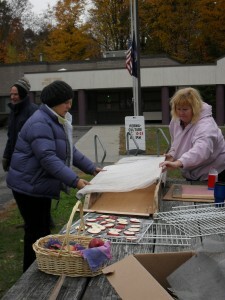 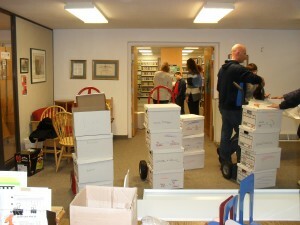 Thank you to all the volunteers who came out to help–we could not have done it without you! 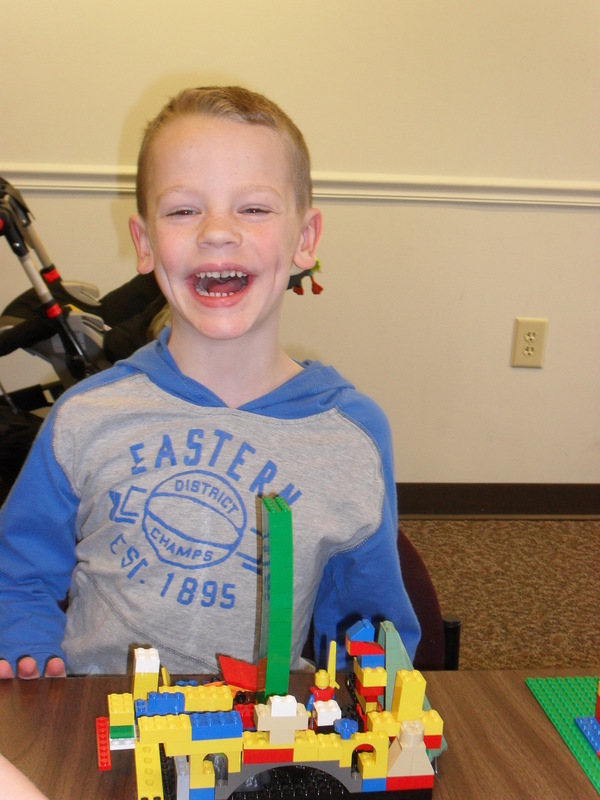 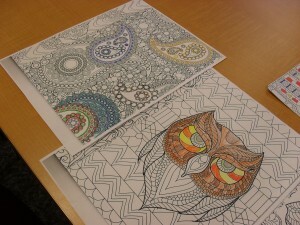 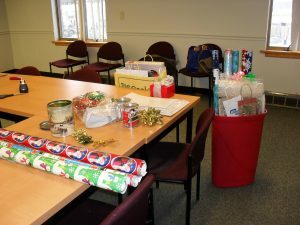 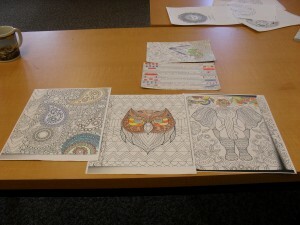 Photos of some of our creations at our “Relax & Color” program on December 19, 2015. We’ll be offering this program again in February. 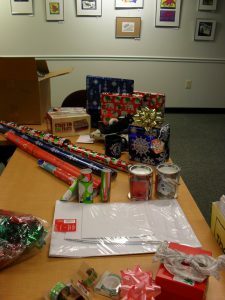 Stay tuned to our website or Facebook page for more details. 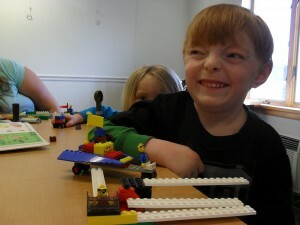 Photos from our most recent Lego Club. 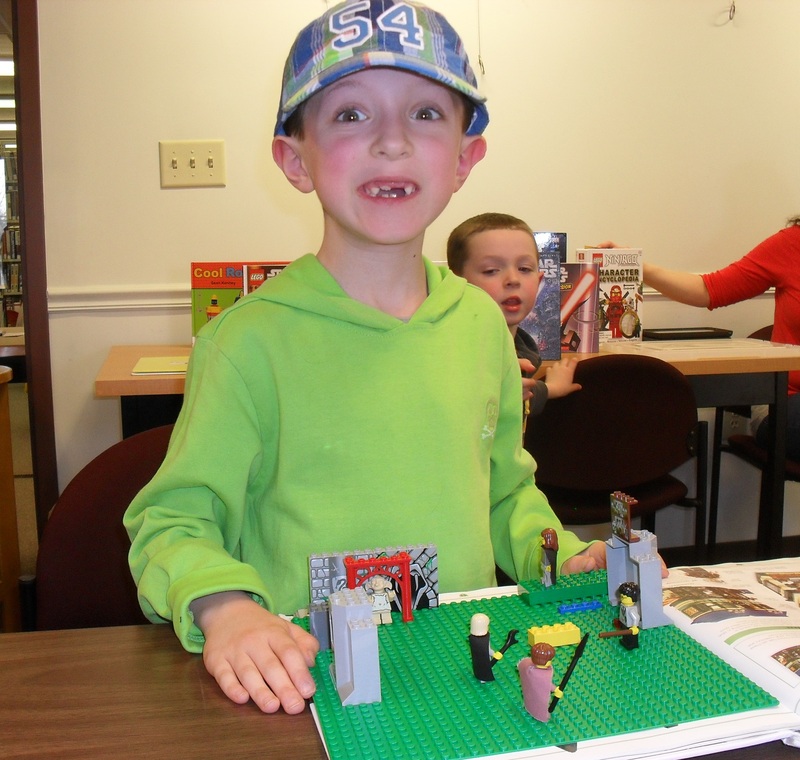 Join us for our next Lego Club on Wednesday, December 30, 2015 at 4 PM. 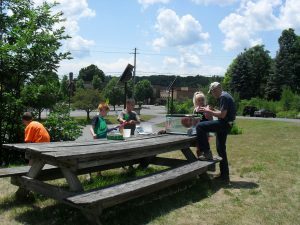 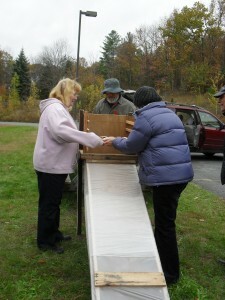 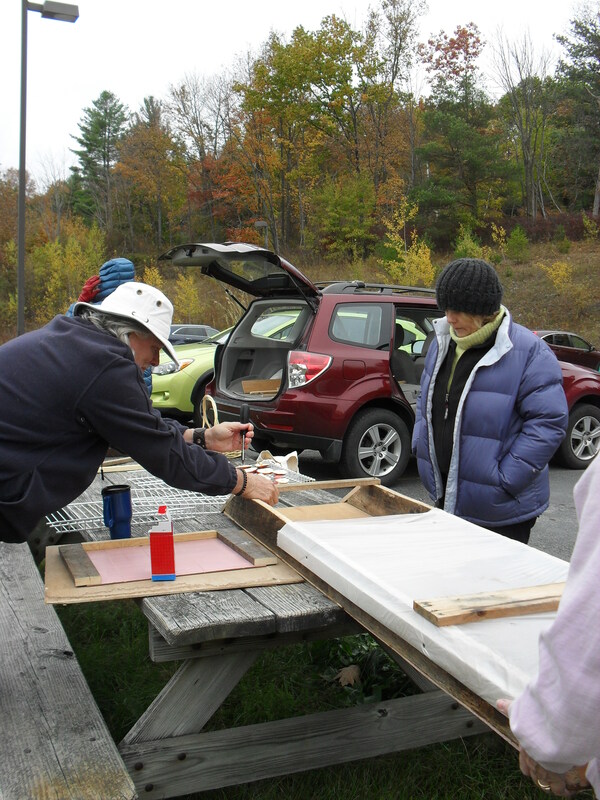 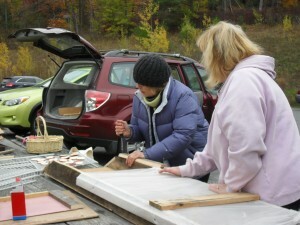 Check out these photos from our recent “Catching the Sun” Permaculture program. 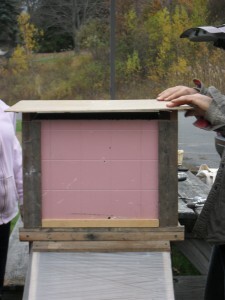 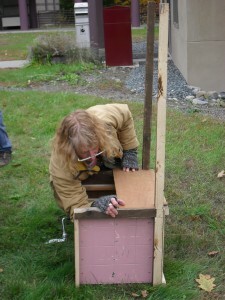 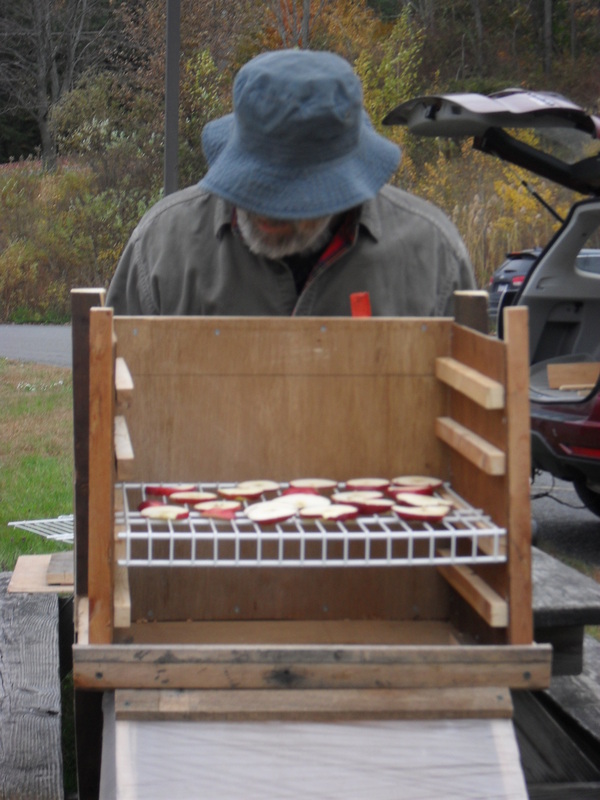 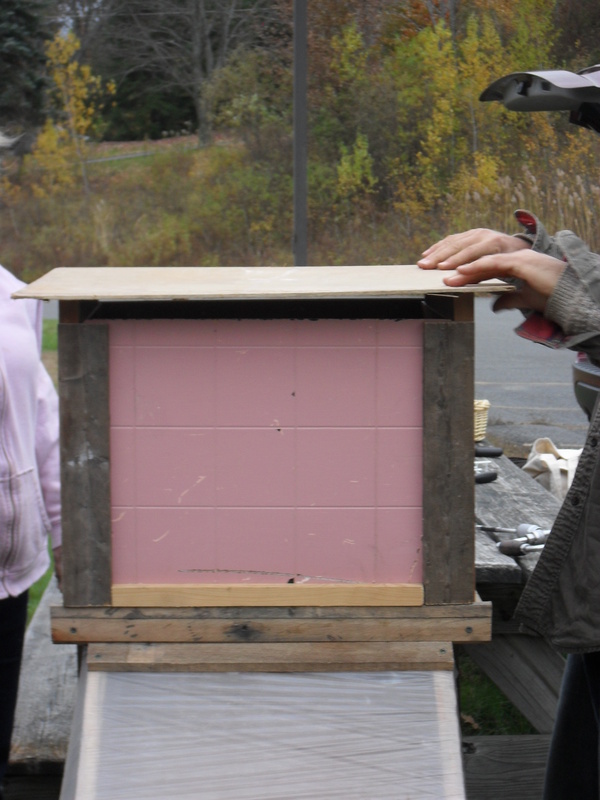 We helped build a Passive Solar Food Dehydrator from almost entirely salvaged materials. 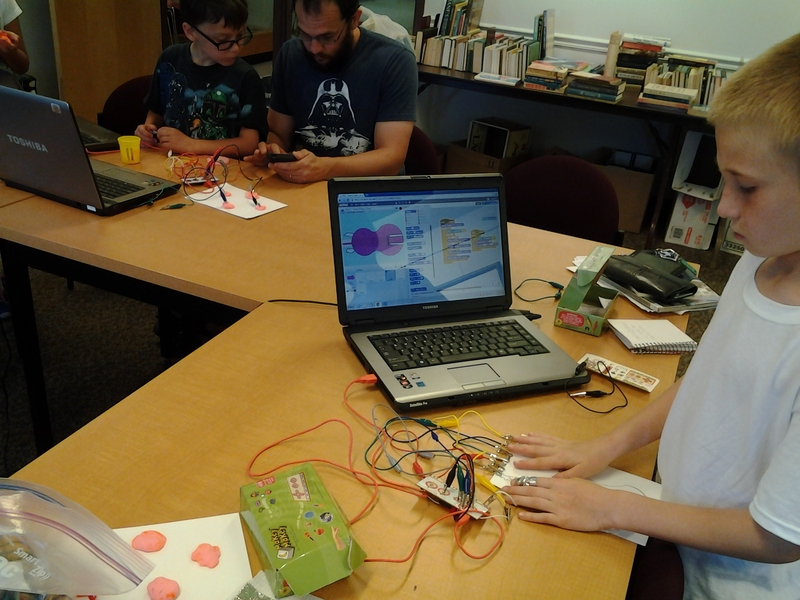 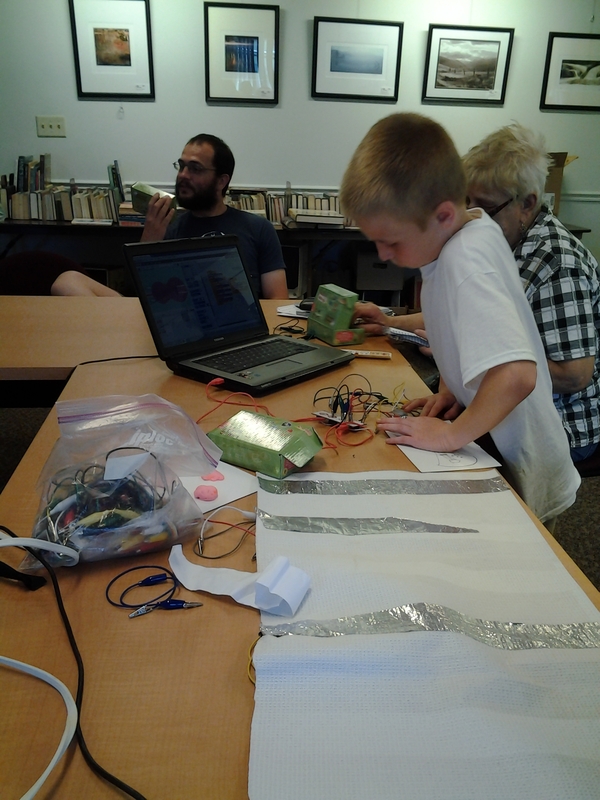 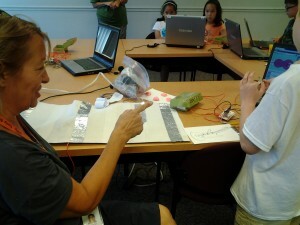 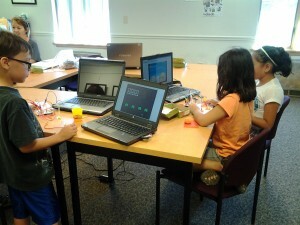 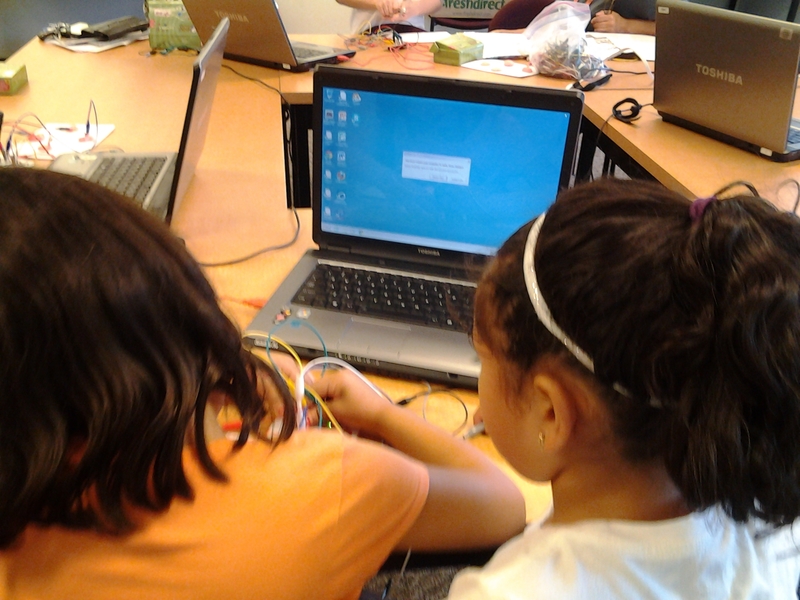 Photos from the STEAM Ahead with Makey-Makey program on Monday, July 20, 2015. 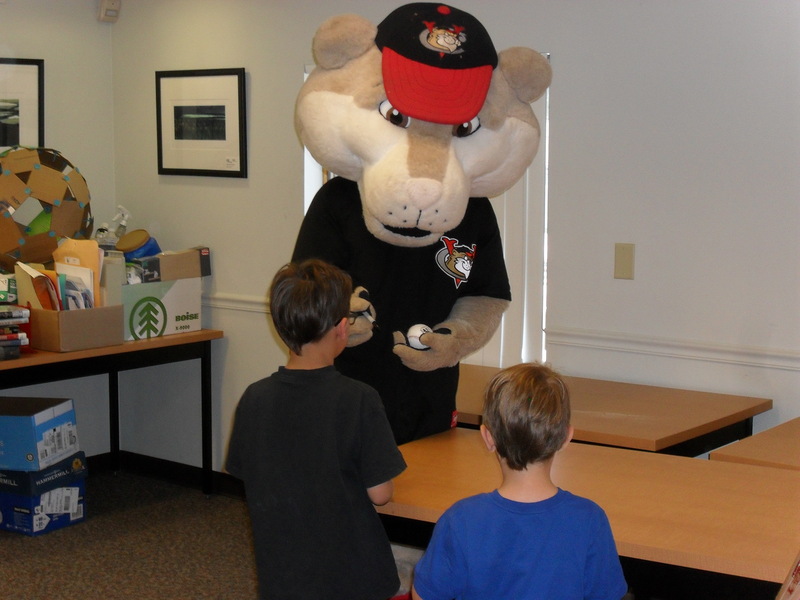 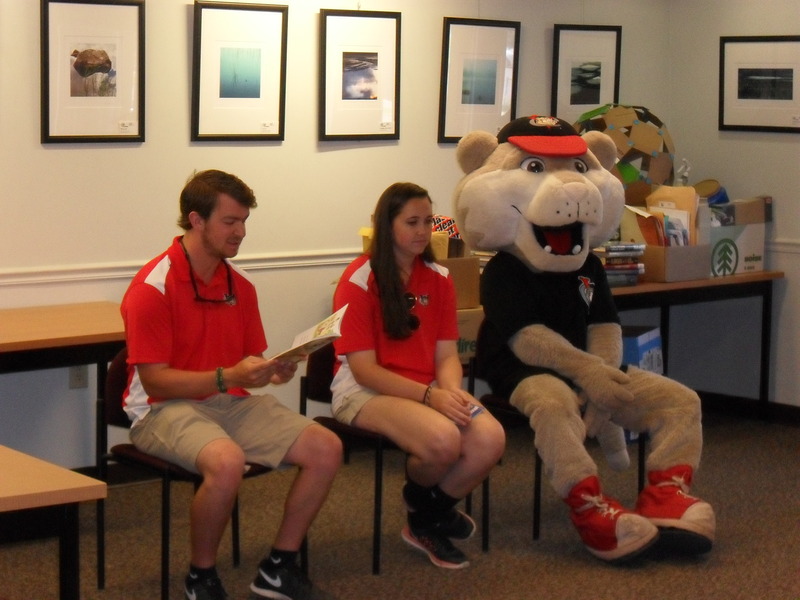 Photos from our visit with SouthPaw from the Tri-City ValleyCats on July 16, 2015. 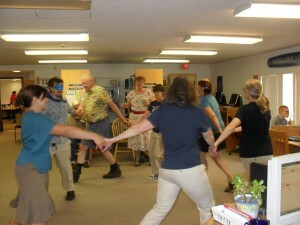 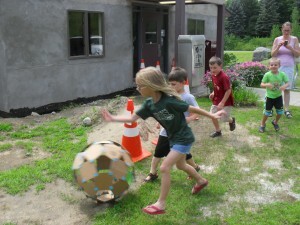 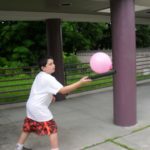 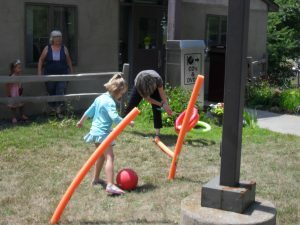 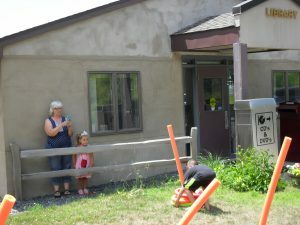 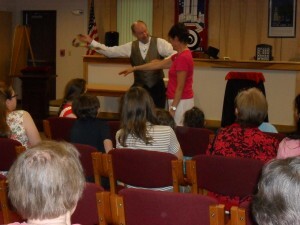 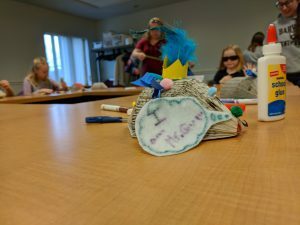 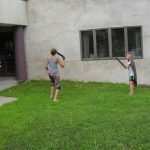 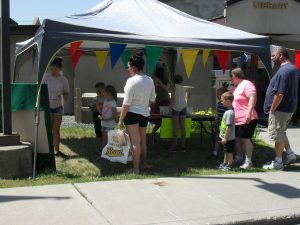 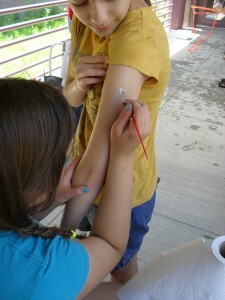 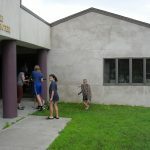 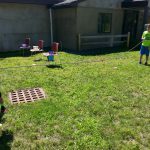 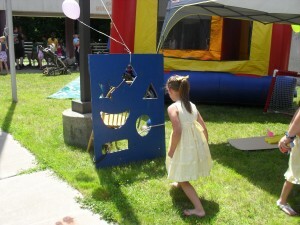 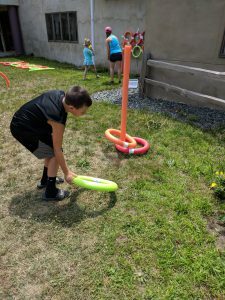 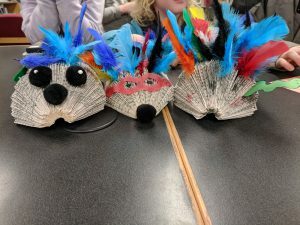 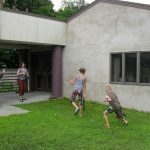 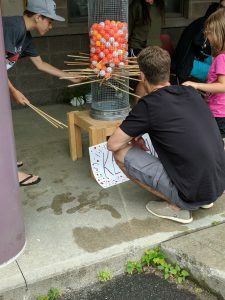 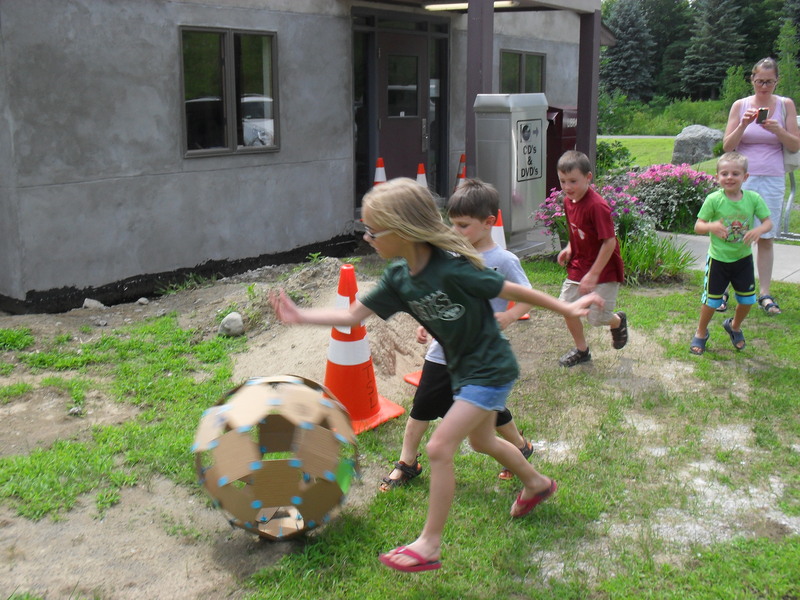 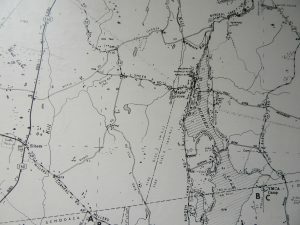 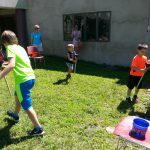 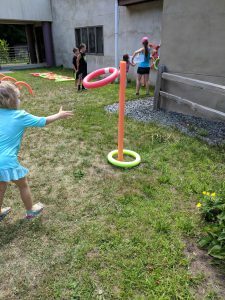 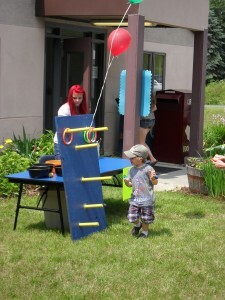 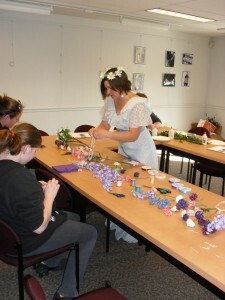 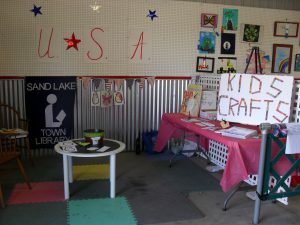 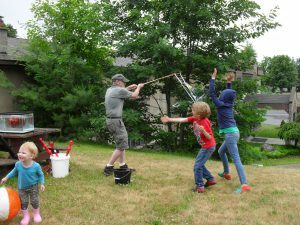 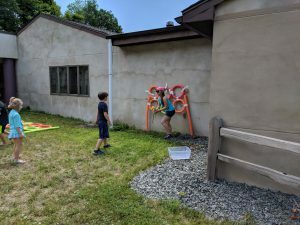 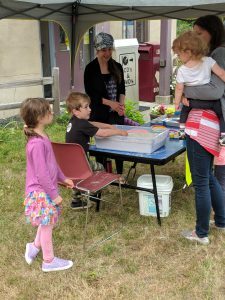 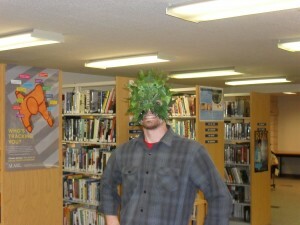 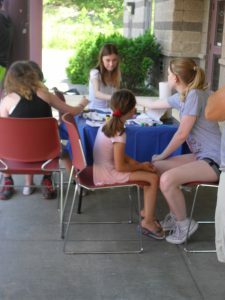 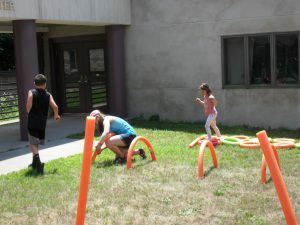 Photos from the Makedo Windball program on Tuesday, July 14th. 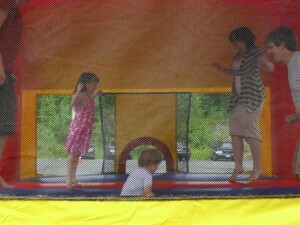 Look like fun? Click on our calendar to see our summer programming. 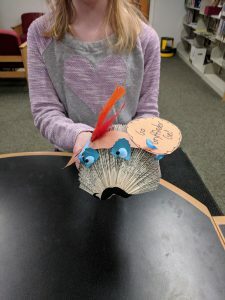 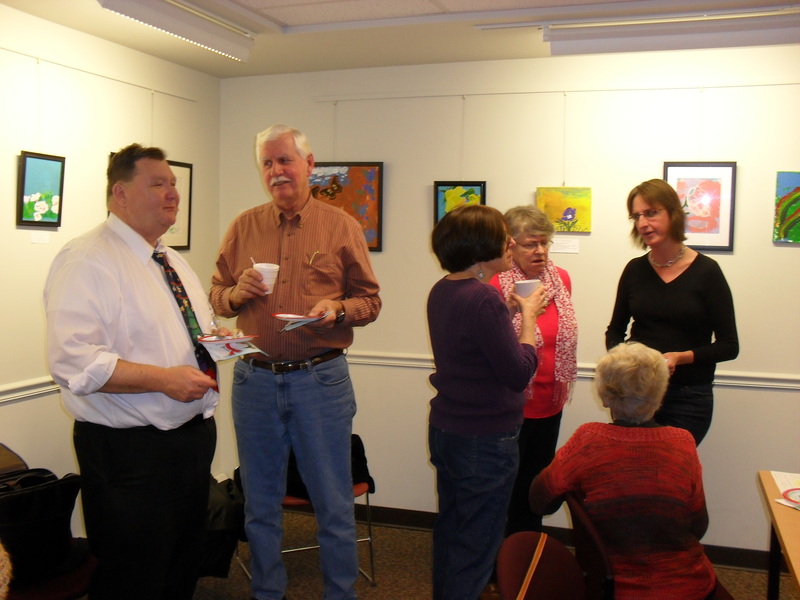 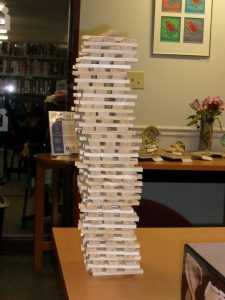 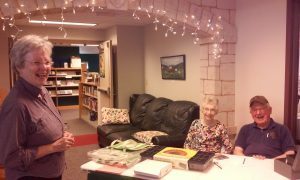 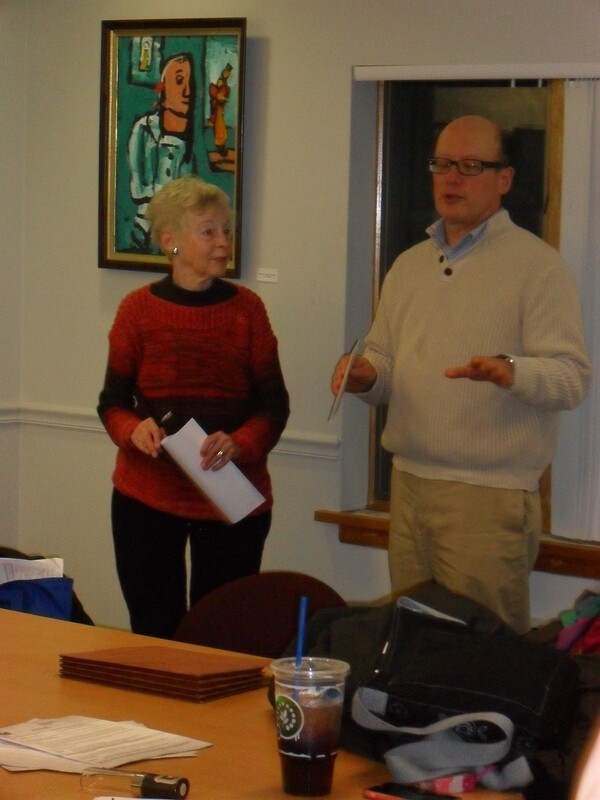 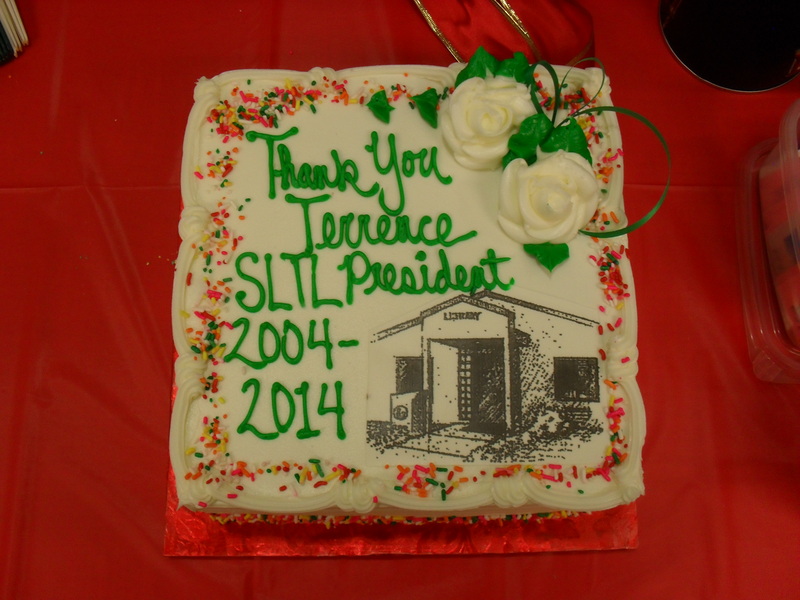 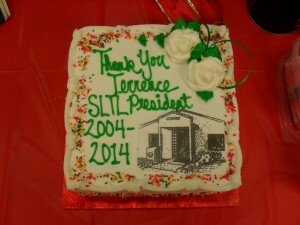 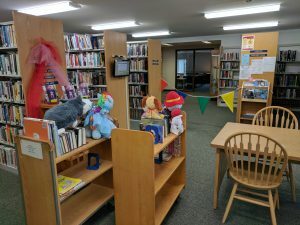 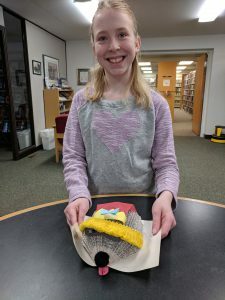 On Thursday evening, December 18, friends, family, and fellow volunteers came together to celebrate the years of service given to the Sand Lake Town Library by long-term Board President Terrence Dingman. 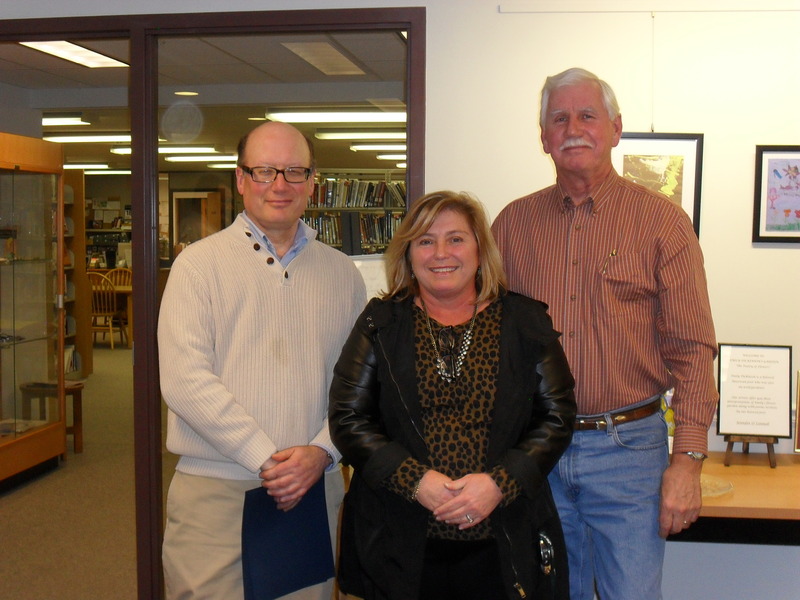 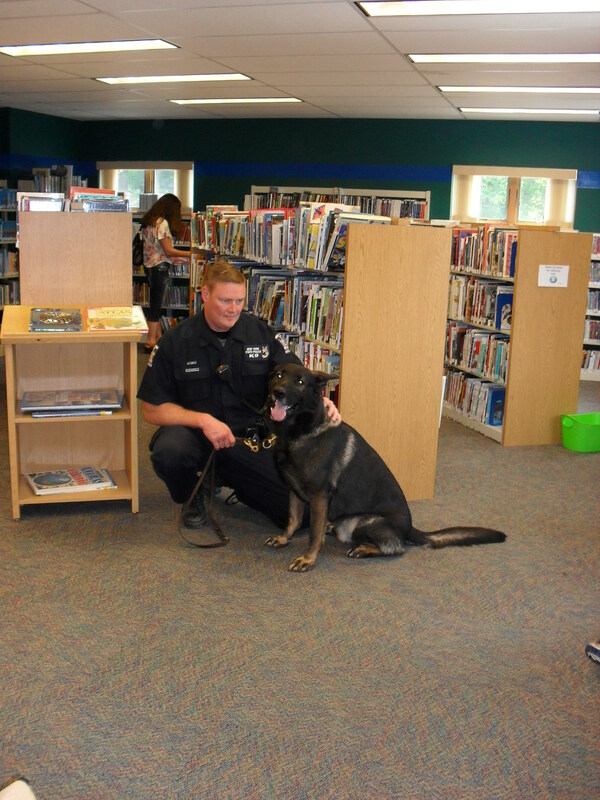 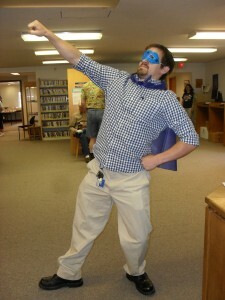 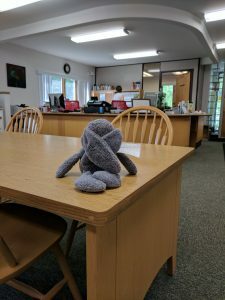 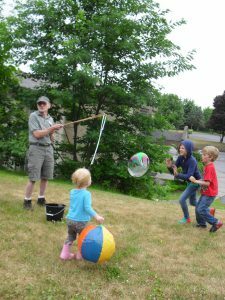 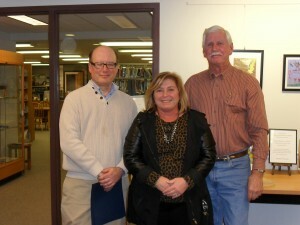 Mr Dingman is stepping down after more than 10 years of dedicated service to the Sand Lake Town Library. Below are pictures from the reception. 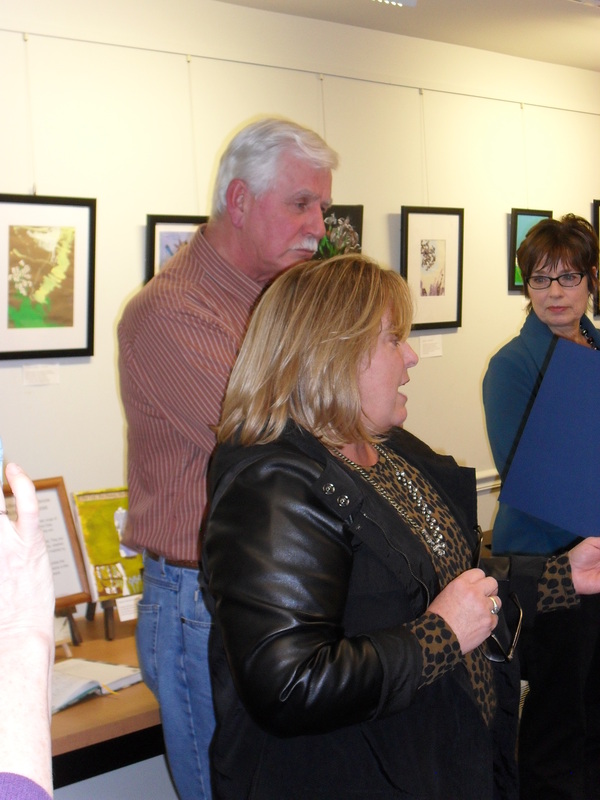 F. Fasoldt reading the town proclamation thanking Mr. Dingman for his dedicated service. 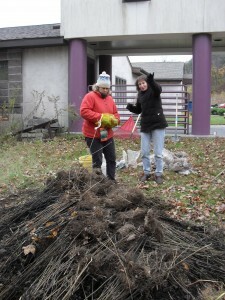 On Saturday, November 1 we started work on what we hope will eventually become an outdoor reading garden. 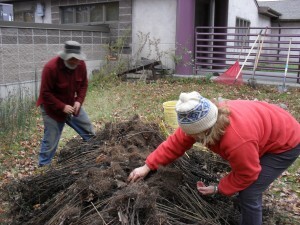 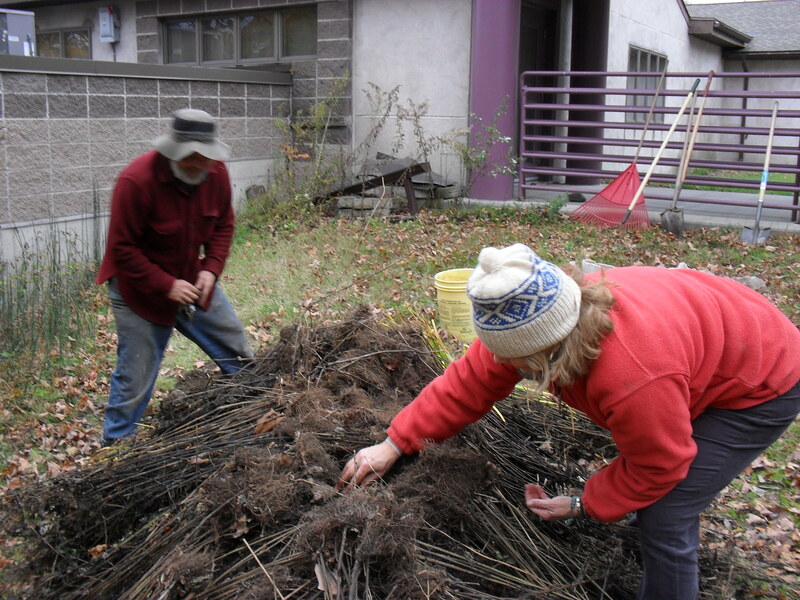 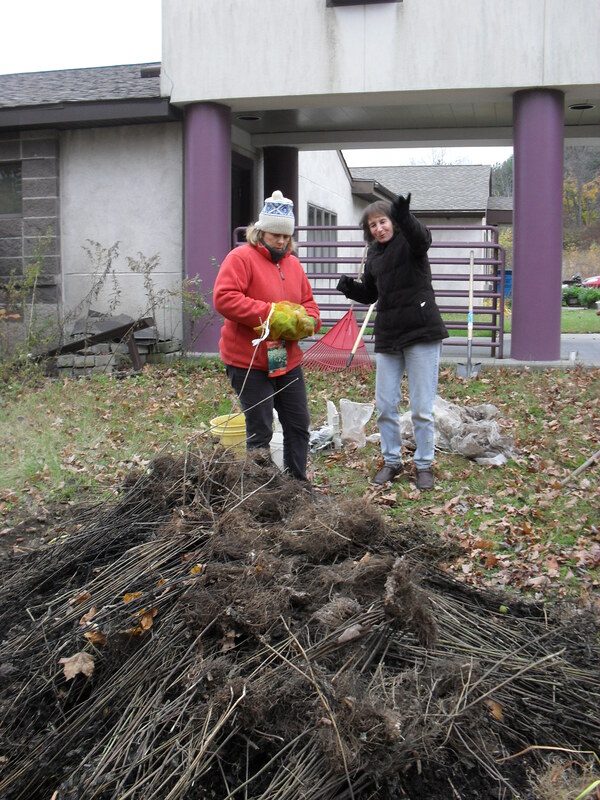 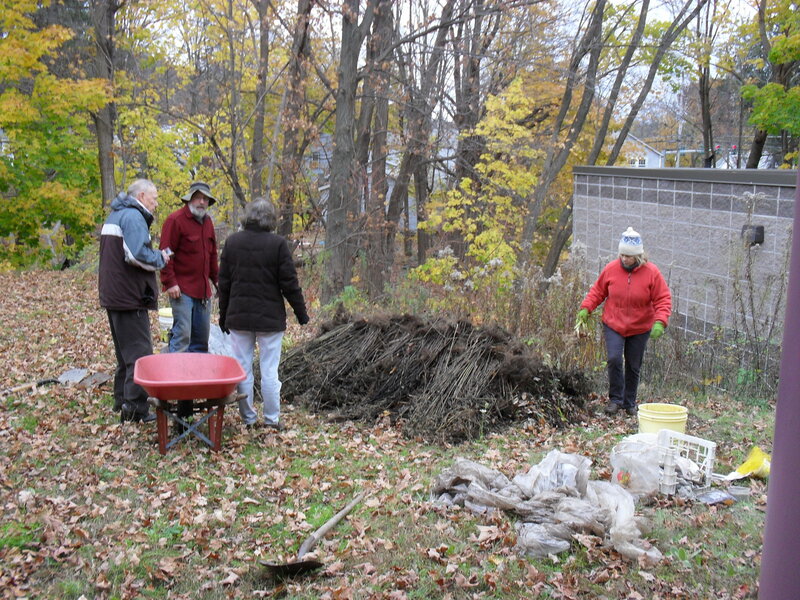 The First step was creating a hugelkultur – a type of raised bed built over logs. 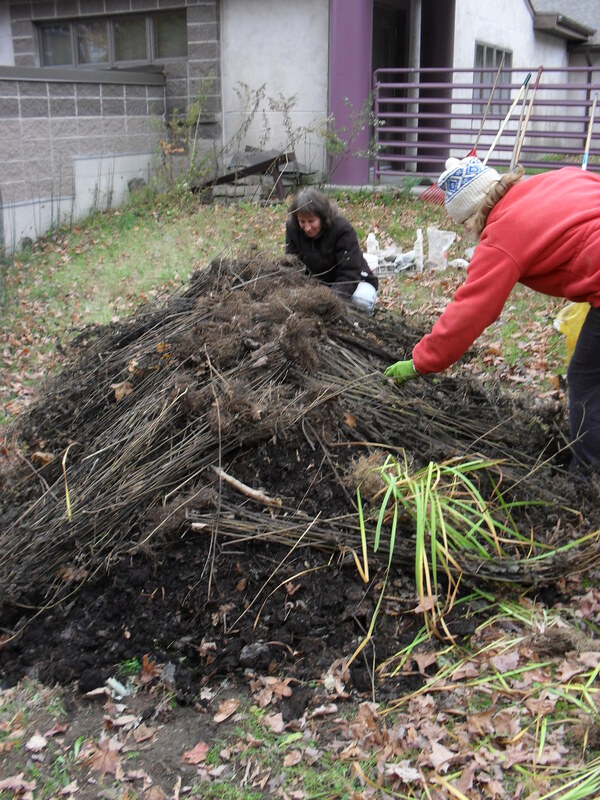 With the addition of some bulbs for spring blooms, our hugelkultur is ready to rest for the winter. 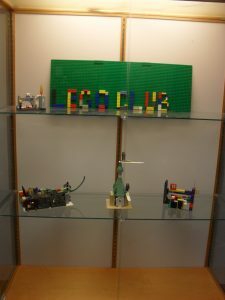 Photos from our most recent Lego Club. 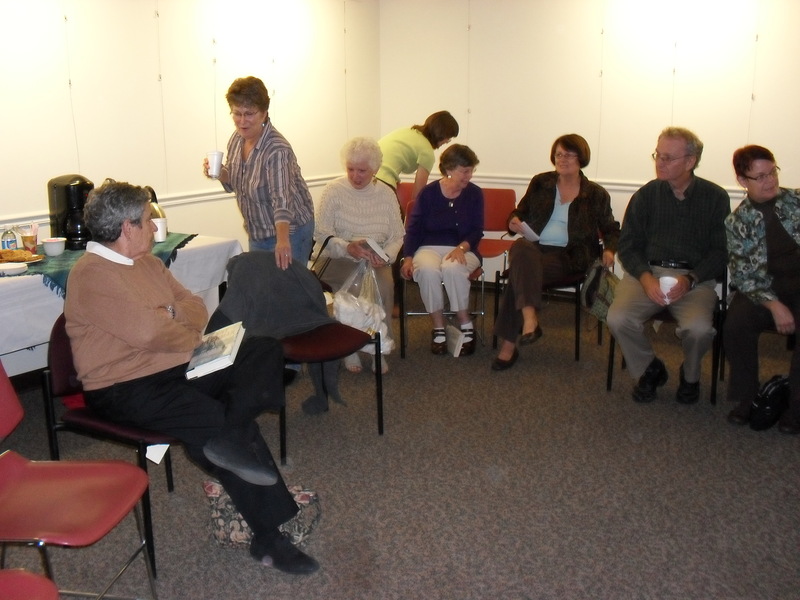 Our next meeting will be Thursday, October 23rd from 4:00-5:00 PM. 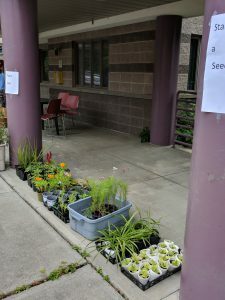 All are welcome! 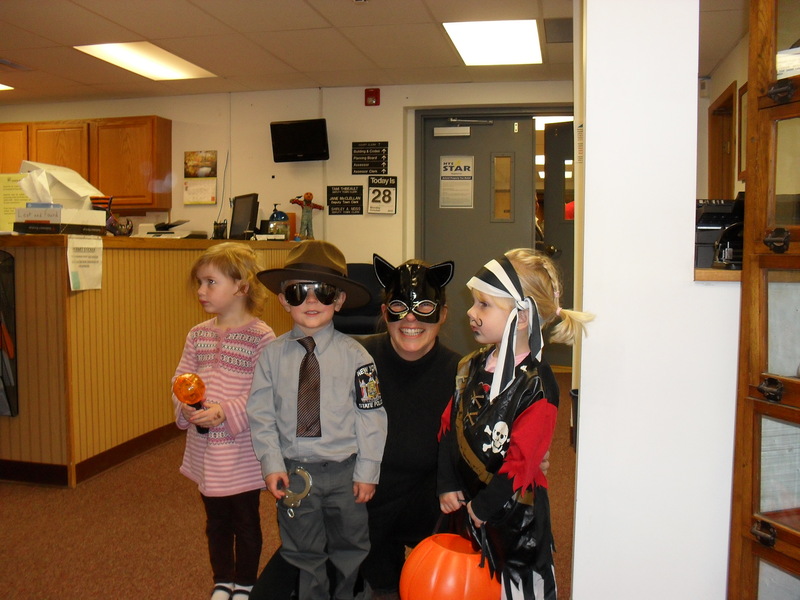 Your local pirates! 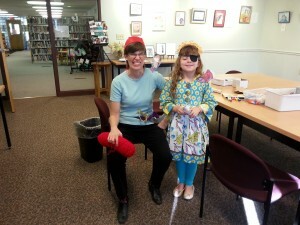 “Talk Like a Pirate Day” was September 19th! 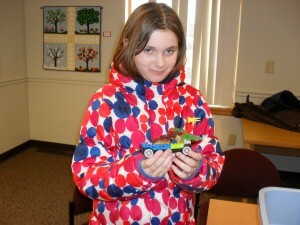 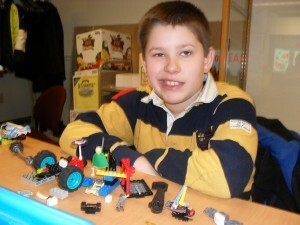 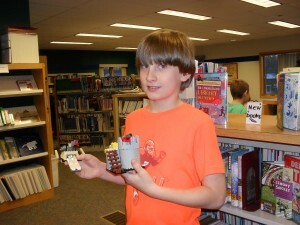 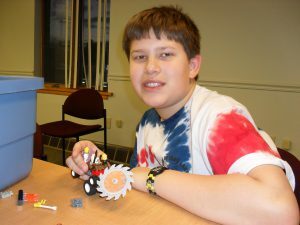 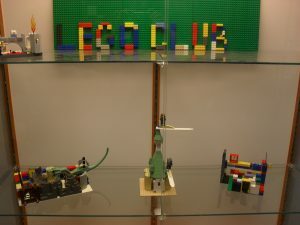 Photos from past Lego Clubs. 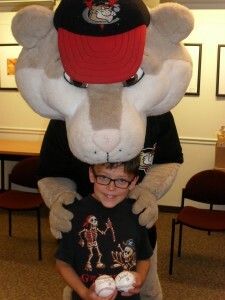 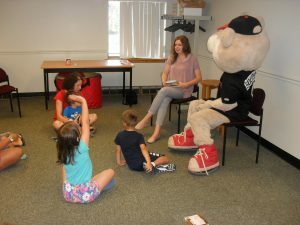 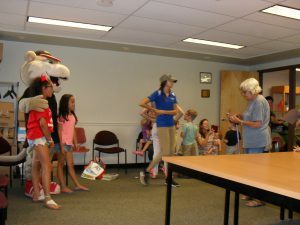 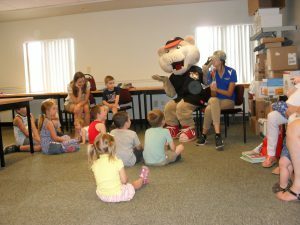 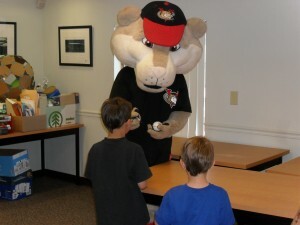 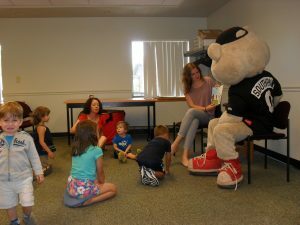 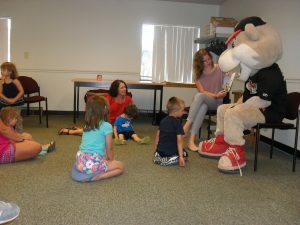 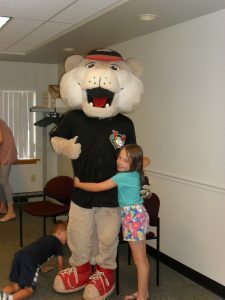 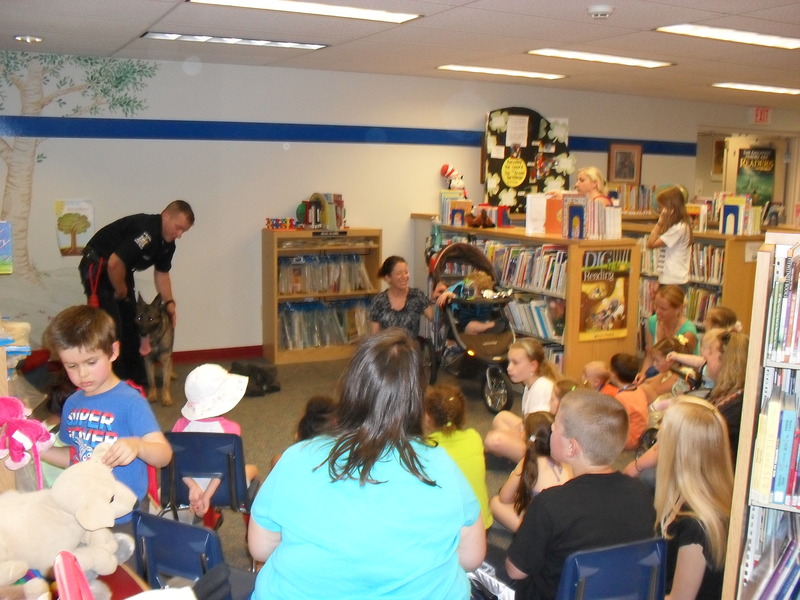 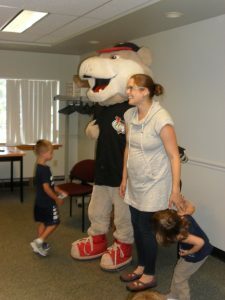 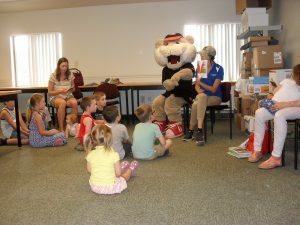 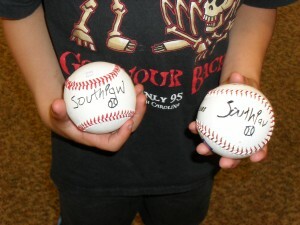 Photos from our storytime visit with the Tri City Valley Cats mascot Southpaw on July 17th, 2014. 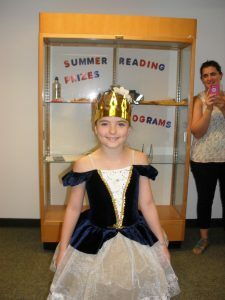 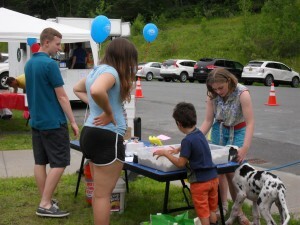 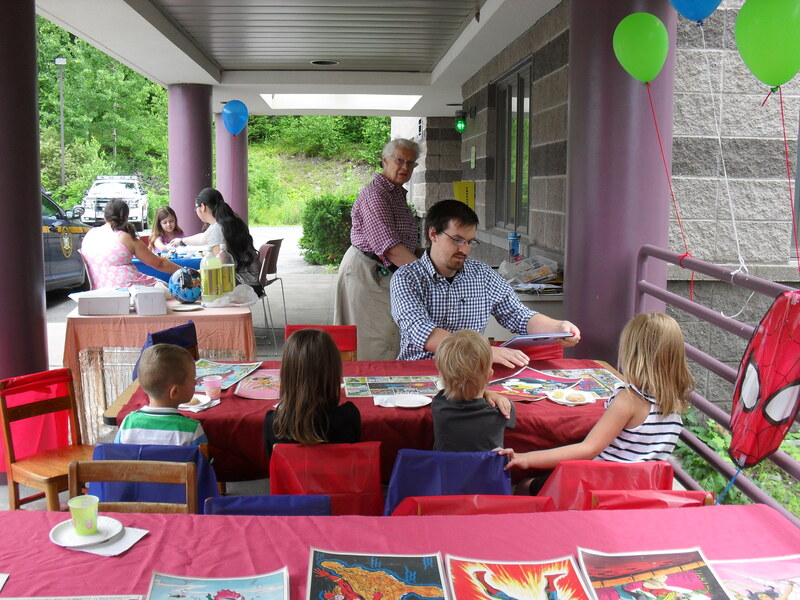 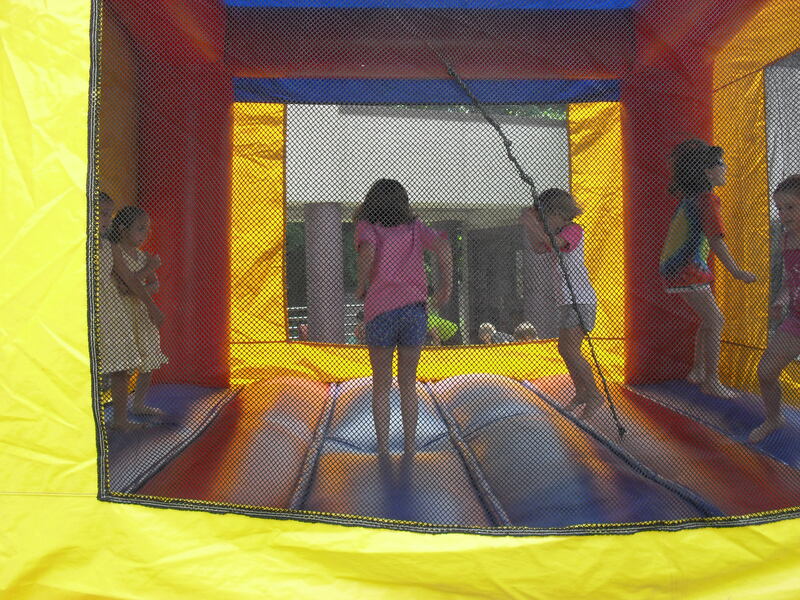 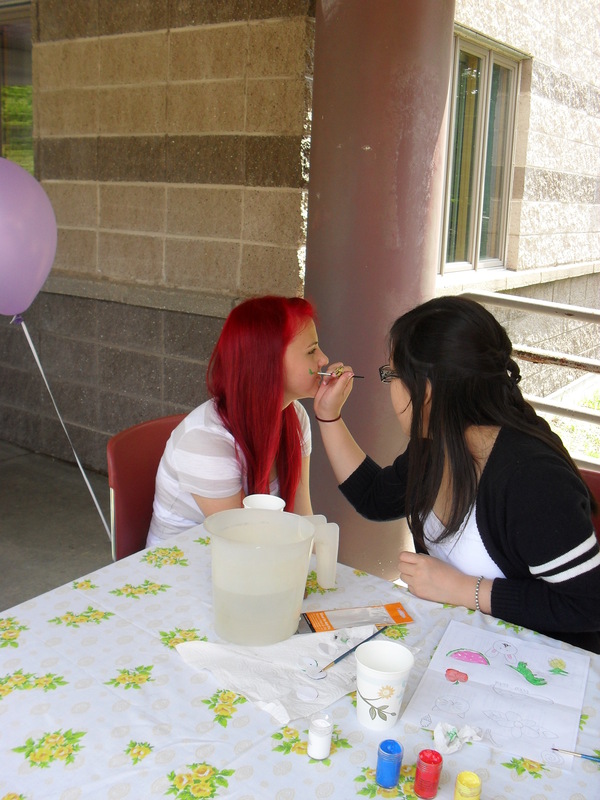 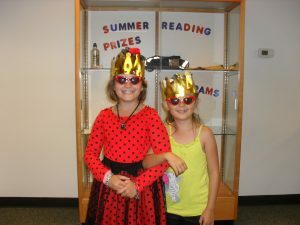 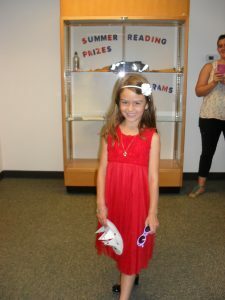 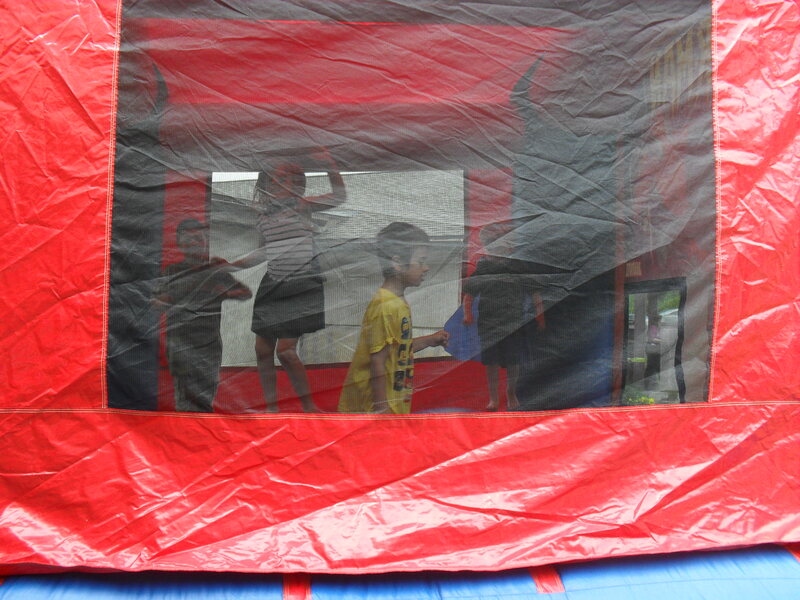 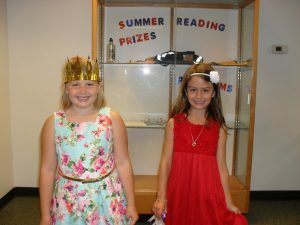 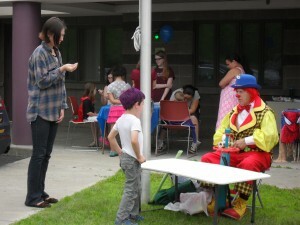 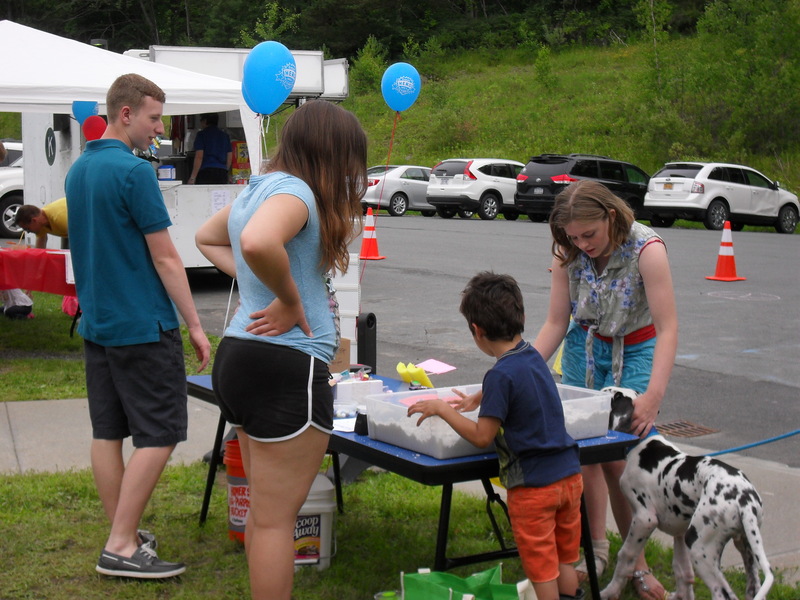 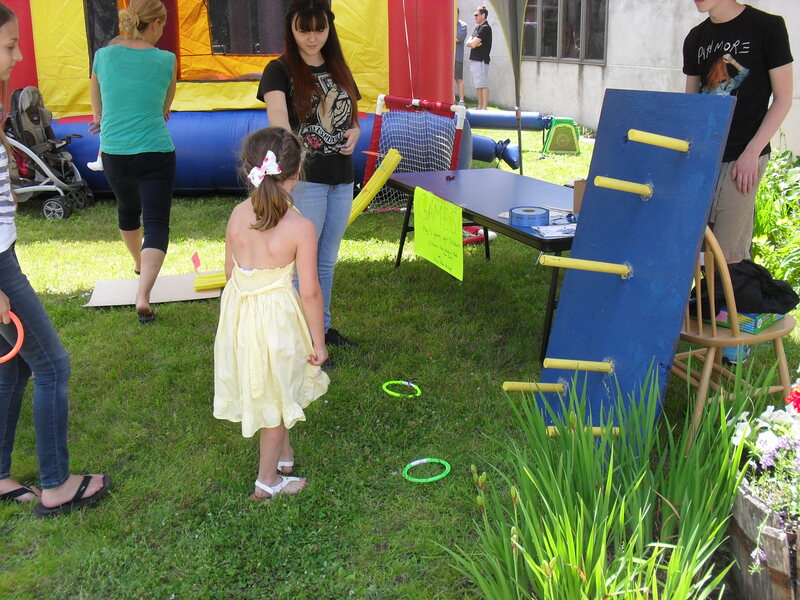 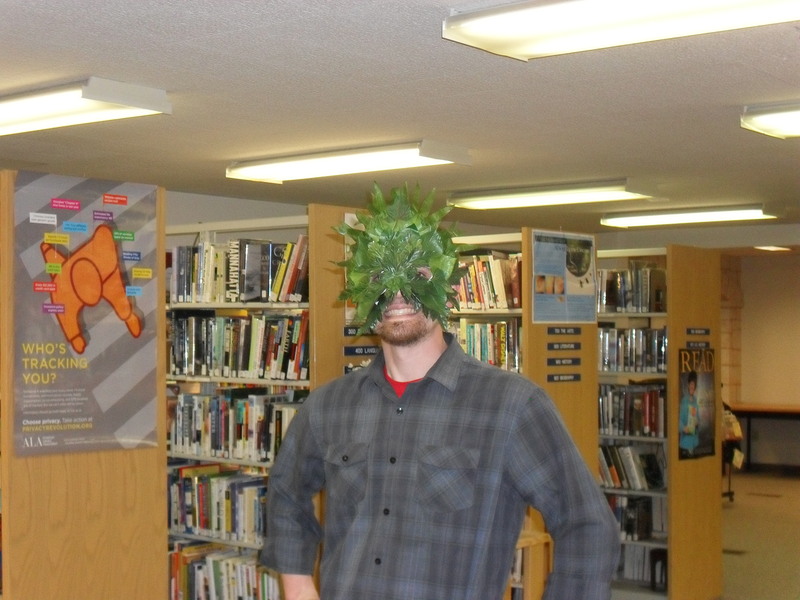 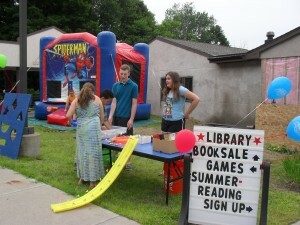 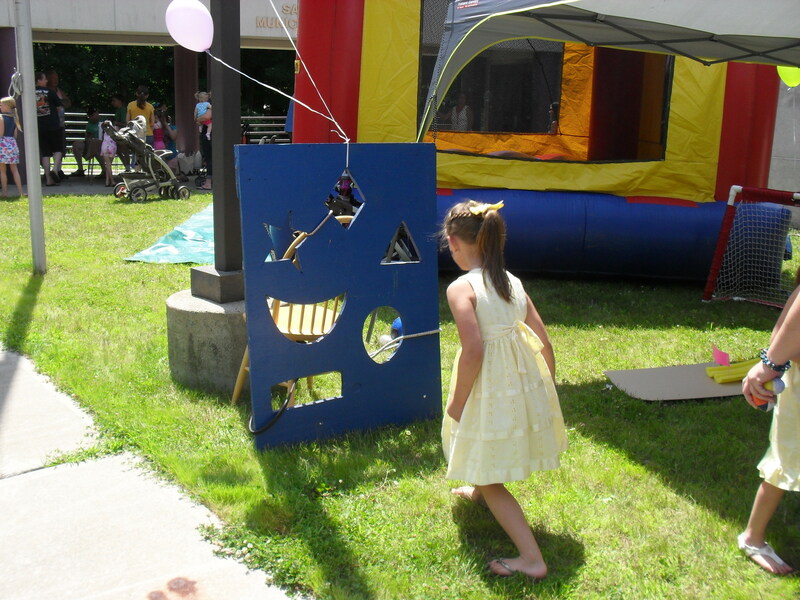 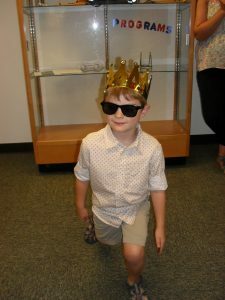 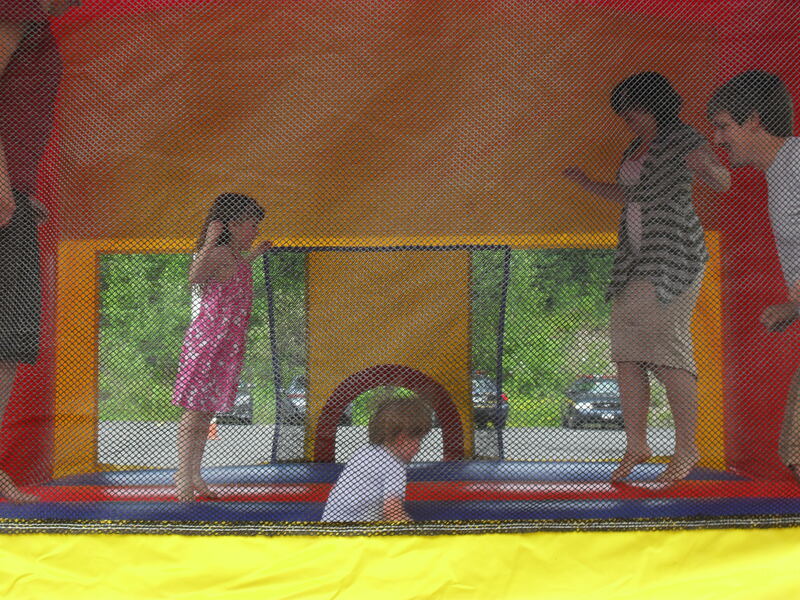 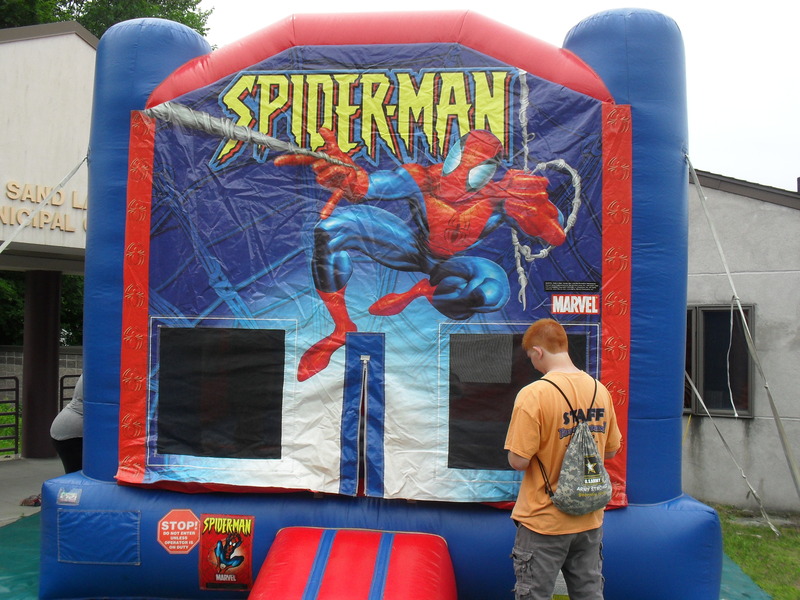 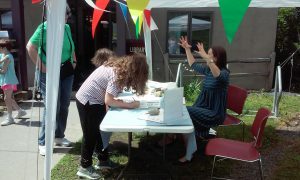 Photos from our Library Fair to kick off Summer Reading 2014. 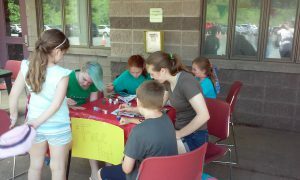 Thanks to everyone who came out and a special thanks to all our volunteers! 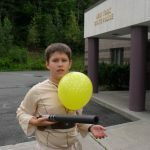 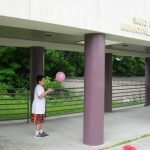 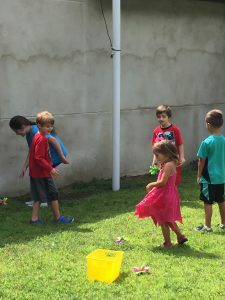 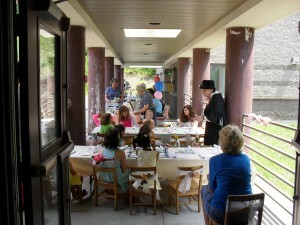 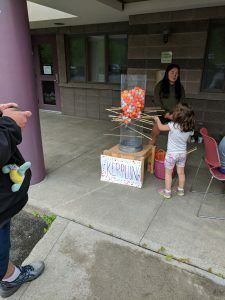 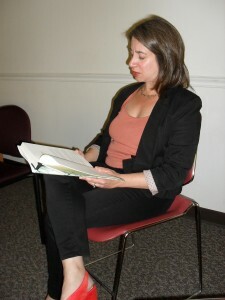 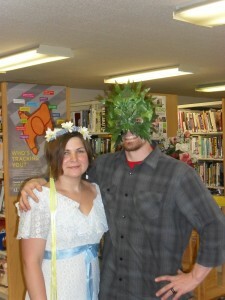 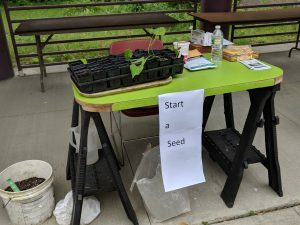 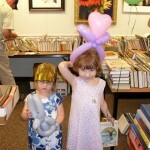 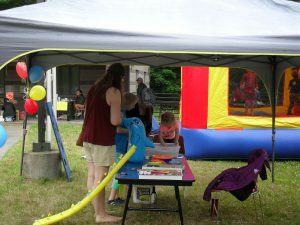 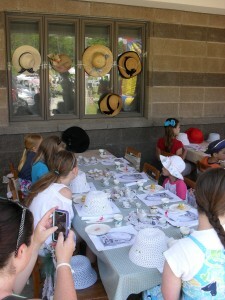 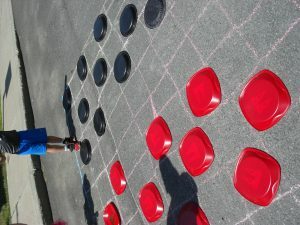 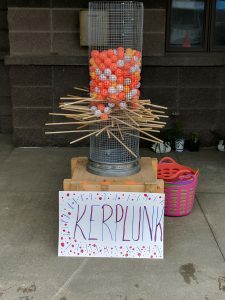 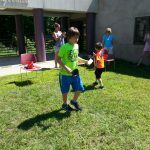 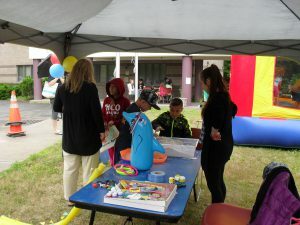 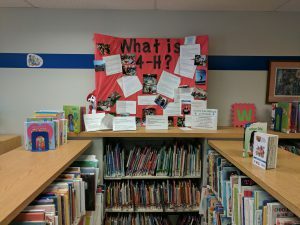 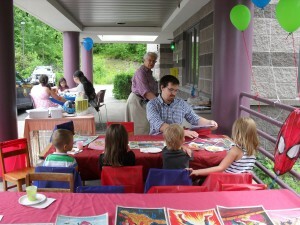 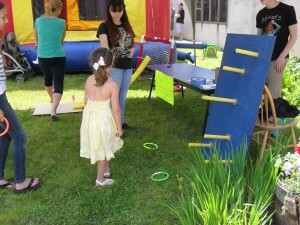 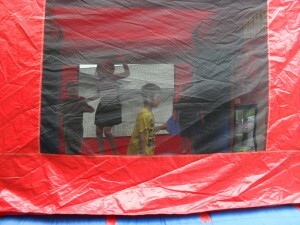 Photos from our May Day celebration! 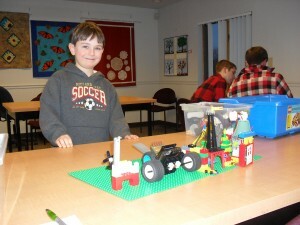 Photos from our most recent Lego Club. 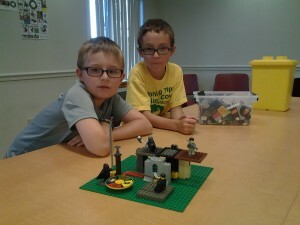 Next Lego Club will meet May 15th from 4:00 to 5:00 PM. 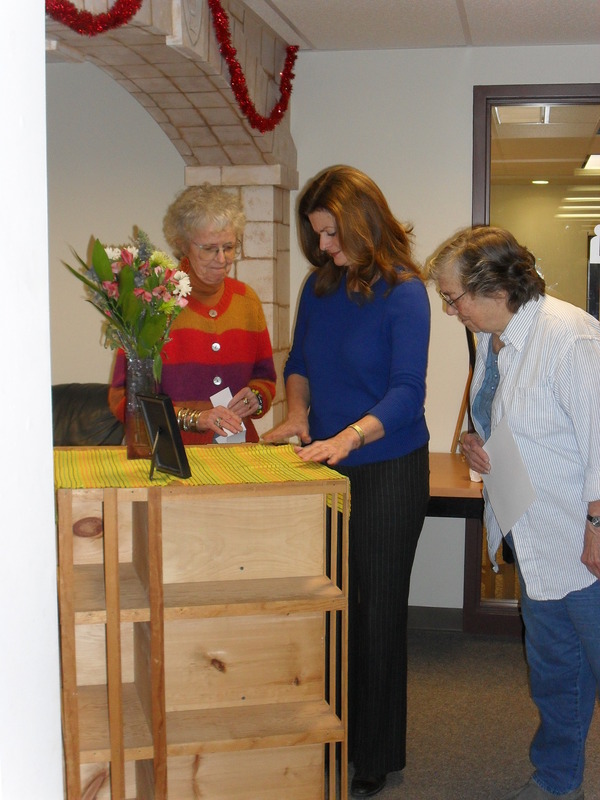 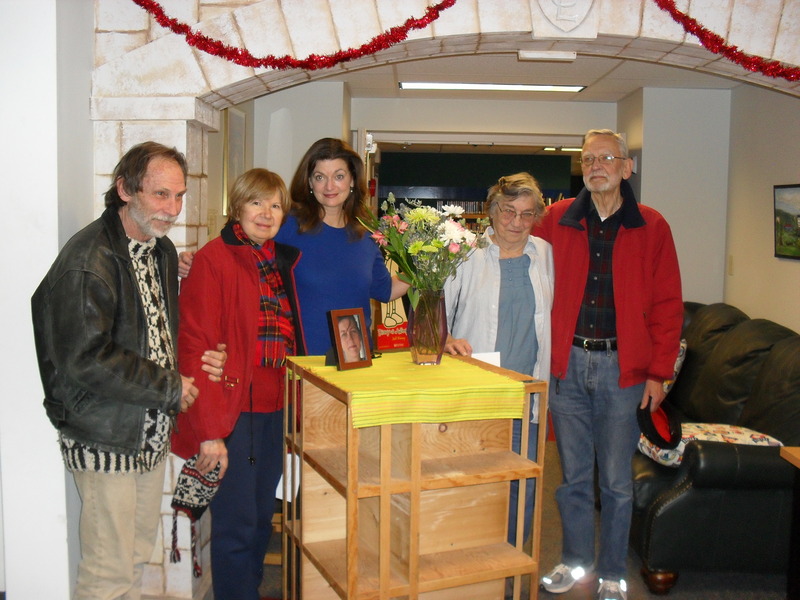 Photos of the dedication of the carousel bookcase in honor on Kathryn Butkus Hardy on January 10, 2014. 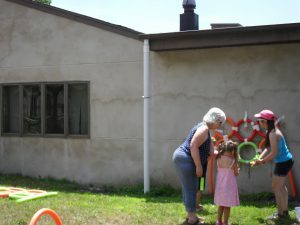 Her family and friends gathered for the dedication on what would have been her 56th birthday. 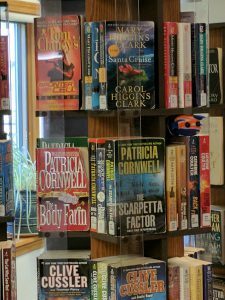 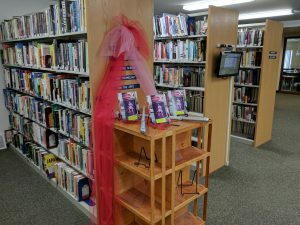 The bookcase was crafted by Robert Harris and donated to the library by Marybeth Pettit and Alejandro Sela. 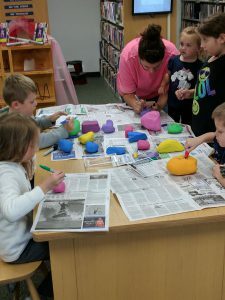 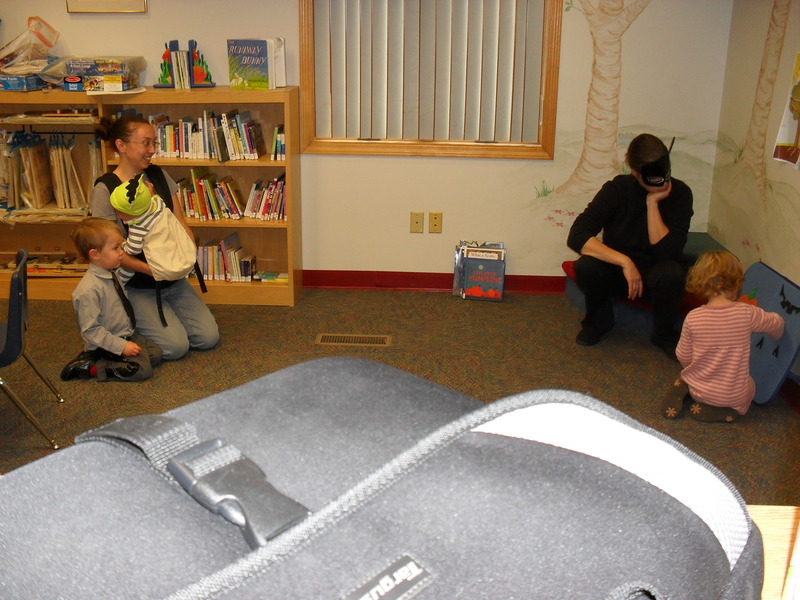 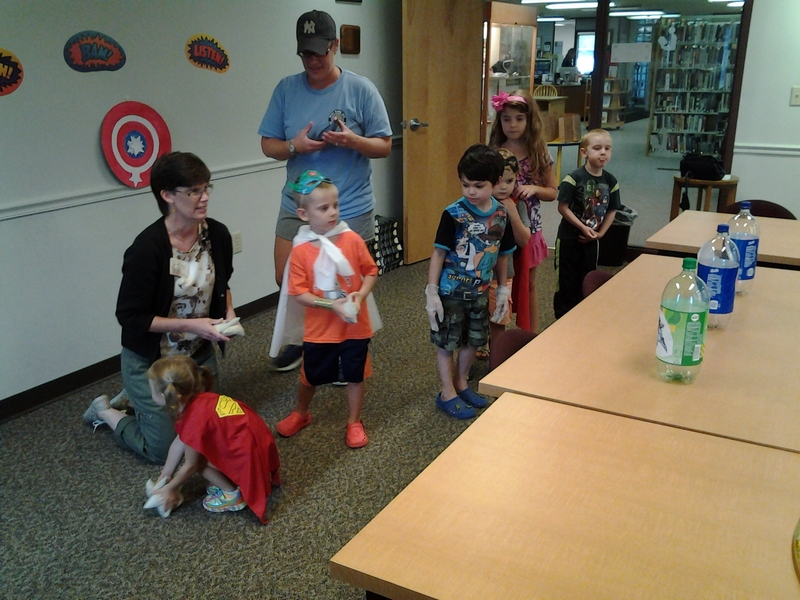 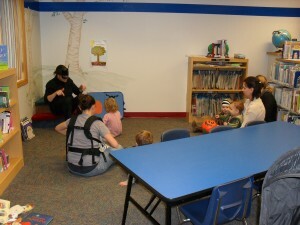 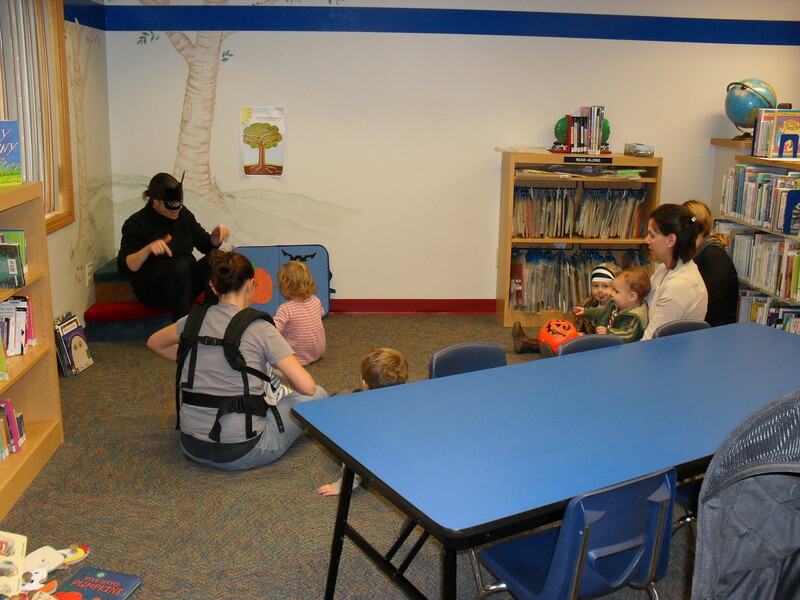 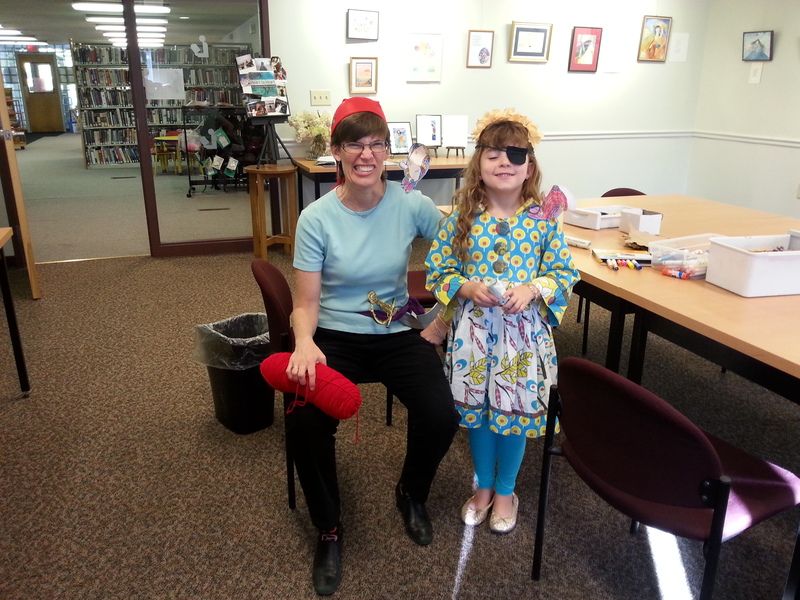 Photos from the Halloween themed Story Time with Miss MaryMargaret on Monday, October 28, 2013. A great time was had by all! 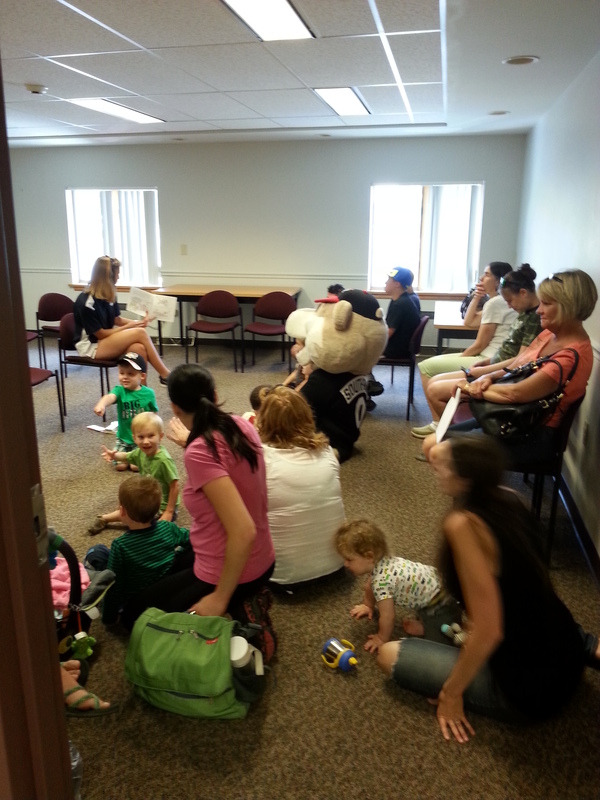 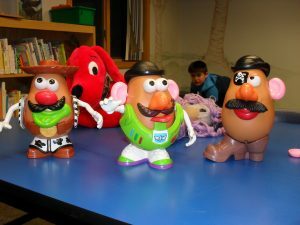 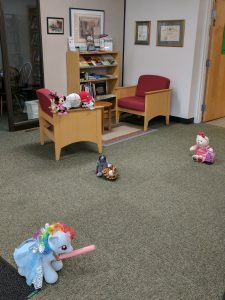 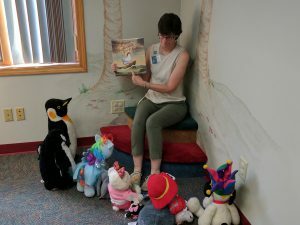 Remember–Story Time takes place every Thursday at 11:15. 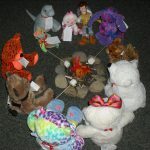 Feel free to join in! 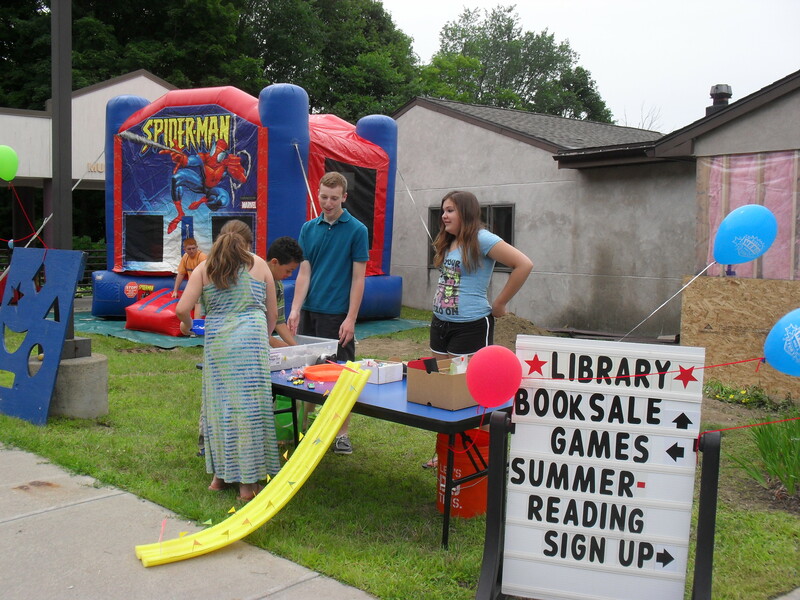 Welcome to SLTL’s 2013 Library Fair! 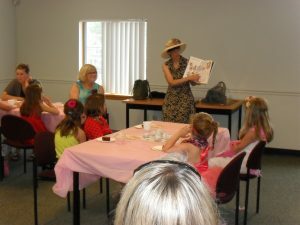 Enjoying a tea party and story! 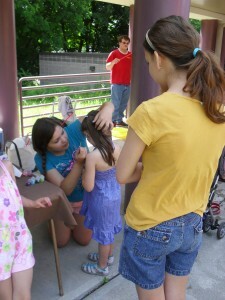 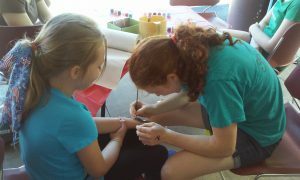 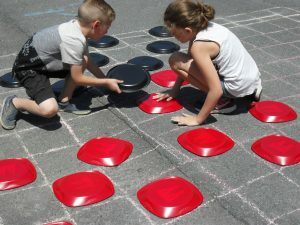 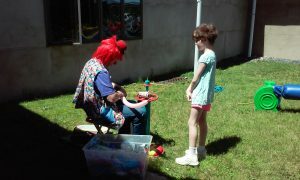 Face-painting and games for everyone! Thanks to all who came out and helped us kick off the 2013 Summer Reading program! 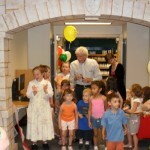 Supervisor Rounds cutting the ribbon to open our renovated Children’s Room. 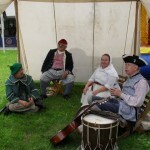 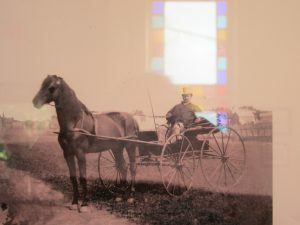 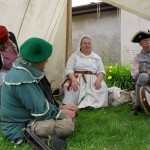 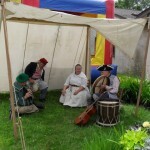 Listening to Rural Felicity, a group of Revolutionary War era musicians. 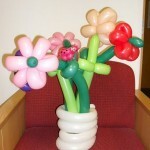 Creations from Victor the Clown. 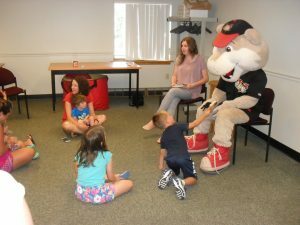 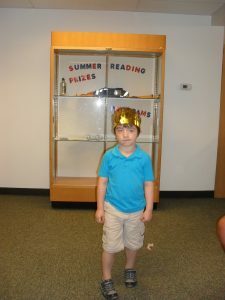 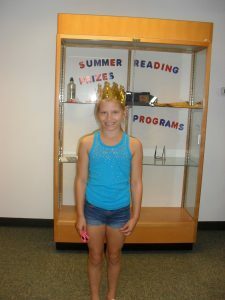 Join us for more fun programs throughout the summer!